I’m back with another pattern in my new Holiday Quietbook series. 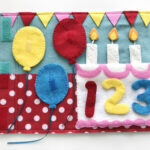 I’m planning to create these throughout the year, and I hope you sew along with me! 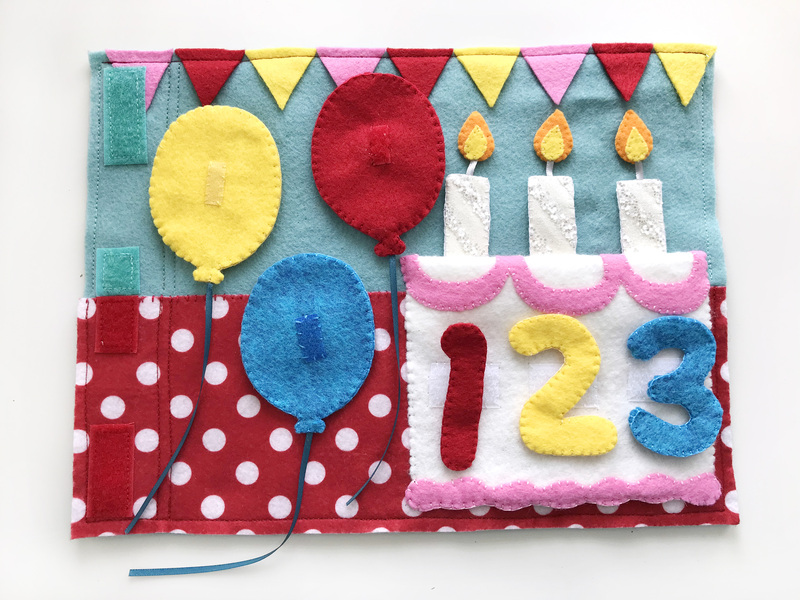 This page is a birthday page you could place anywhere in the holiday book, or make it as a stand-alone page. 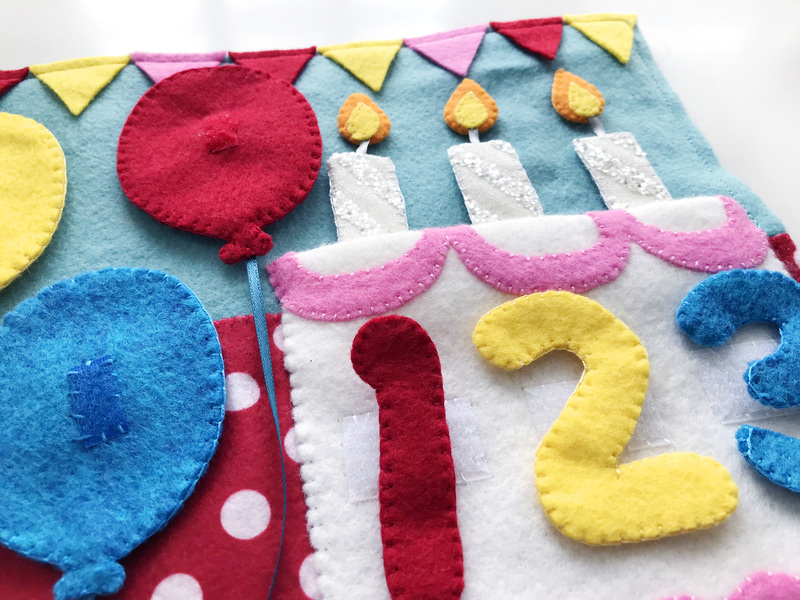 You can convert it to a 2-page spread by having two background pages and moving the balloons to the second page. 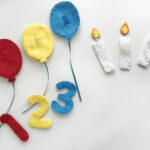 It is an easy page to swap up the colors on, though I do like having the primary colors for the balloons and numbers. Assorted Ribbon: I used thin teal ribbon for the balloons and thin silver for the candle wicks. 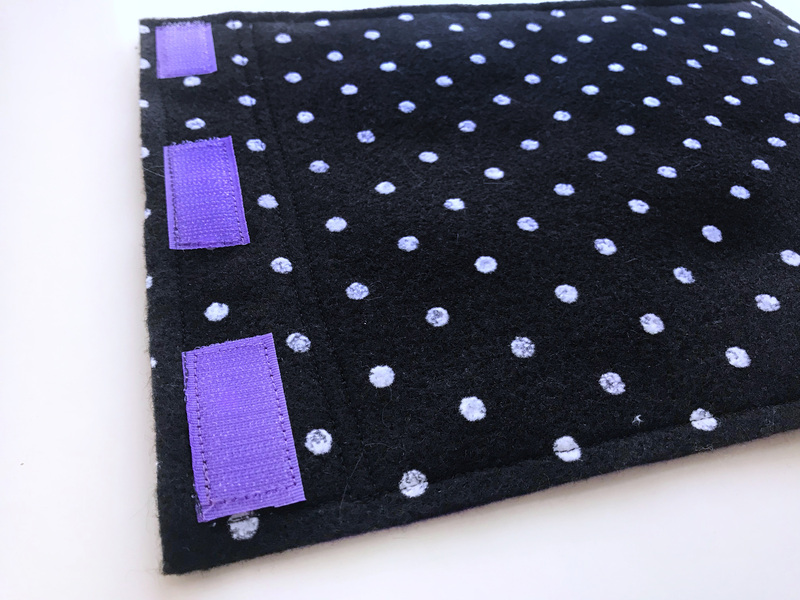 Your Choice of Binding Method: I’ve always used 3 grommets, but I’m testing out three 2″ hook & loop strips. 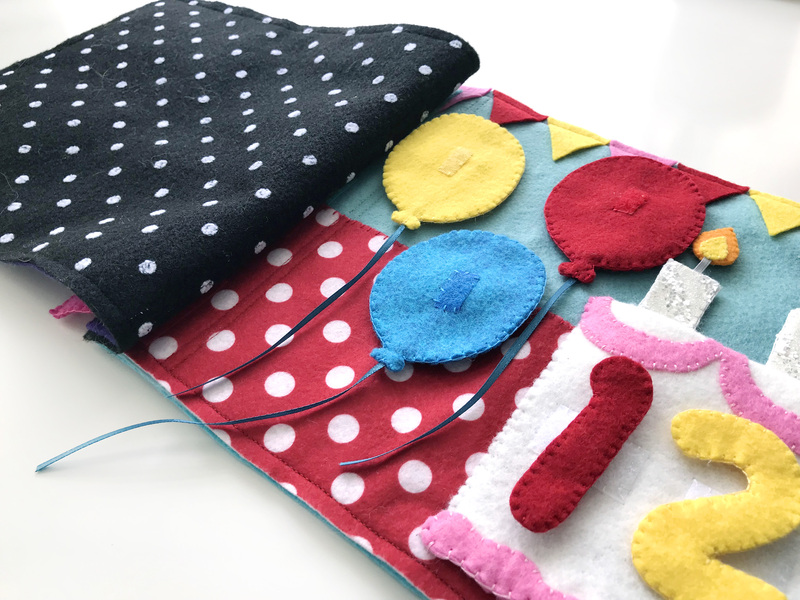 I used an appliqué stitch to sew down red polka dot felt onto the lower half of the page (mine was 12″ wide by 4.5″ high.) Refer to the picture above for where to sew three colored squares of hook and loop (soft side) for the balloons. 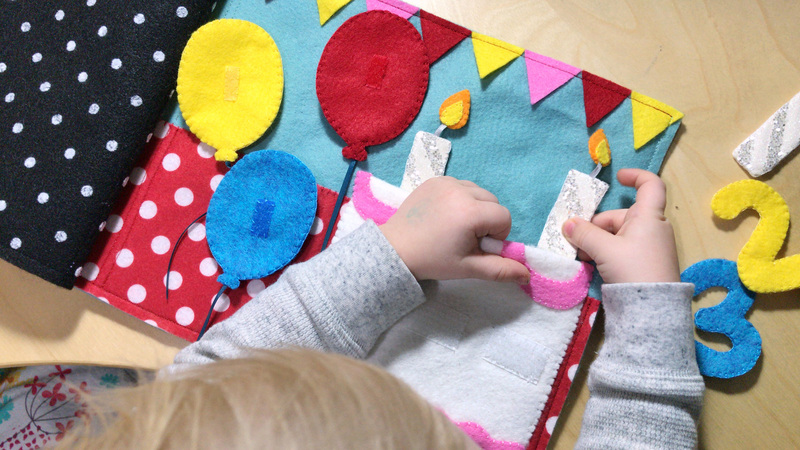 I recommend doing that after the cake and balloons are sewn so you know everything has room. To attach the triangle flags, I just did a light line of glue across the top to tack them on to the top of the page. They got sewn down when I attached the backing onto the page with my sewing machine. The cake is actually a bit more complicated then it looks. It has a shallow open pocket on the top and the rest is a pocket you access from the bottom and snap closed. Start by decorating the cake. Sew down the icing swap and the top edge of the bottom icing. There is a larger bottom icing piece that goes on the other side of the cake. I glued it down lightly while lining it up with the front bottom icing, then I blanket stitched around the bottom edge through both layers. 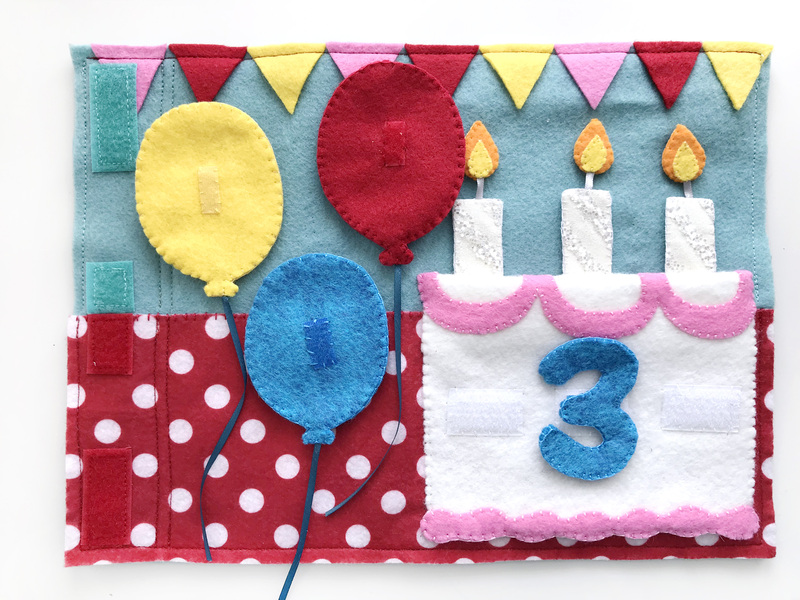 Sew three white snag free velcro bits onto the cake. 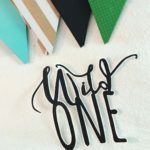 I prefer to use snag free wherever I need the rough side of hook and loop on an actual page. Even though it doesn’t quite hold as well as traditional Velcro, the rough side is just too snaggy with felt. Sew two snaps onto the inner bottom icing to hold the bottom pocket closed. 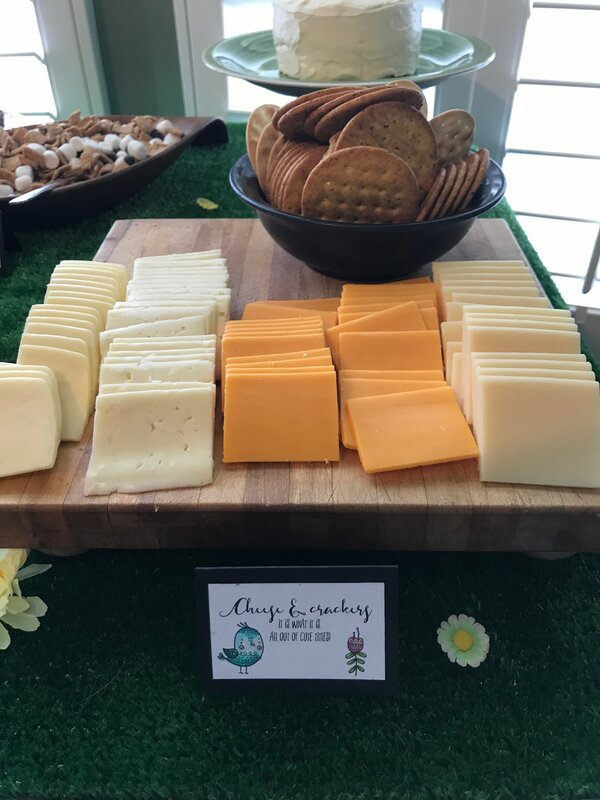 Scroll down to the end of the cake section for a picture of the snaps. 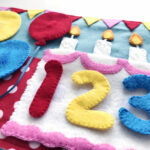 The tricky part is sewing the cake down to the page. You need to make a good crease where shown on the pattern. (I can use a light ironing on my felt, but test yours first! Sometimes using a straight edge to crease it works fine.) Place the cake piece as shown above: upside-down and wrong side facing out with the fold a bit above the table line. 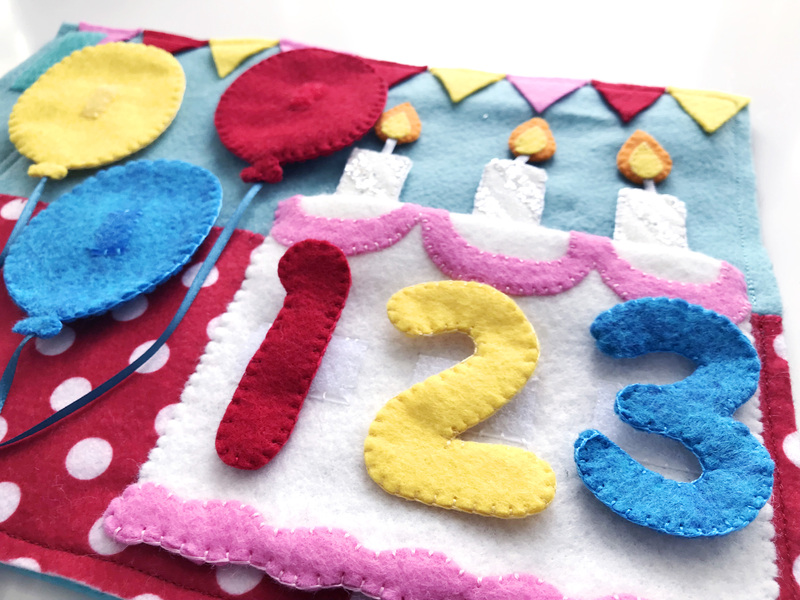 Make sure your cake fits well on the page when folded back down before sewing down the three sections shown above in hot pink. When folded back down, you’ll have a shallow pocket at the top for the candles to sit in (or be stored sideways in.) Finish the cake by sewing down the sides of the cake. I did sew down the sides of the pink parts as well as the white cake sides. The last step is the sew the other halves of the snaps down to the page. 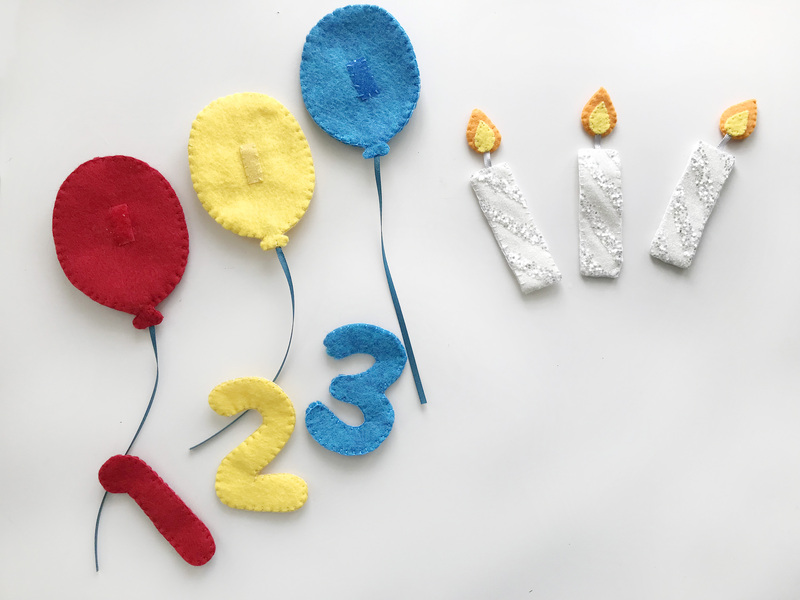 Start your candles by sewing each yellow flame onto three of the orange flames, lining up the bottoms. I tacked them down with a touch of glue first. Then sandwich a bit of ribbon between the flames and the rest of the orange flame pieces. The ribbons should stick out of the bottoms. 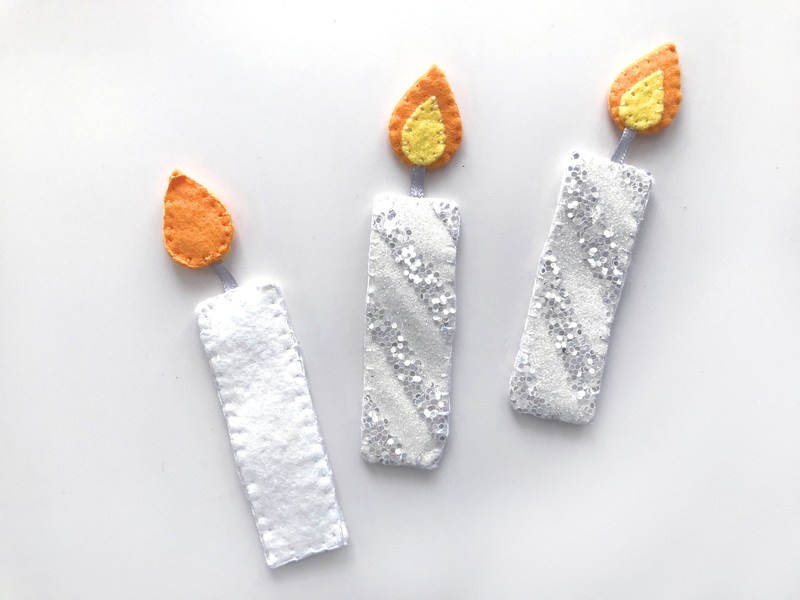 The candle part is made of of the glitter stripe material and white felt. 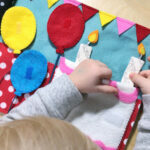 When you blanket stitch around it, be sure to catch the other end of the ribbon/wick in the top of the candle. The balloons are fairly straightforward. 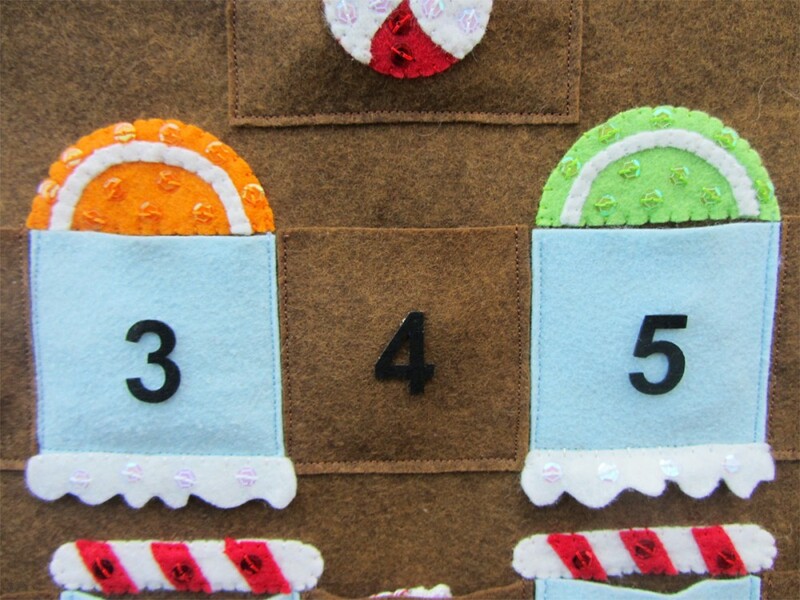 Sew a square of white snag-free Velcro to the backing pieces. Sew a bit of matching hook and loop (soft side) to the fronts. 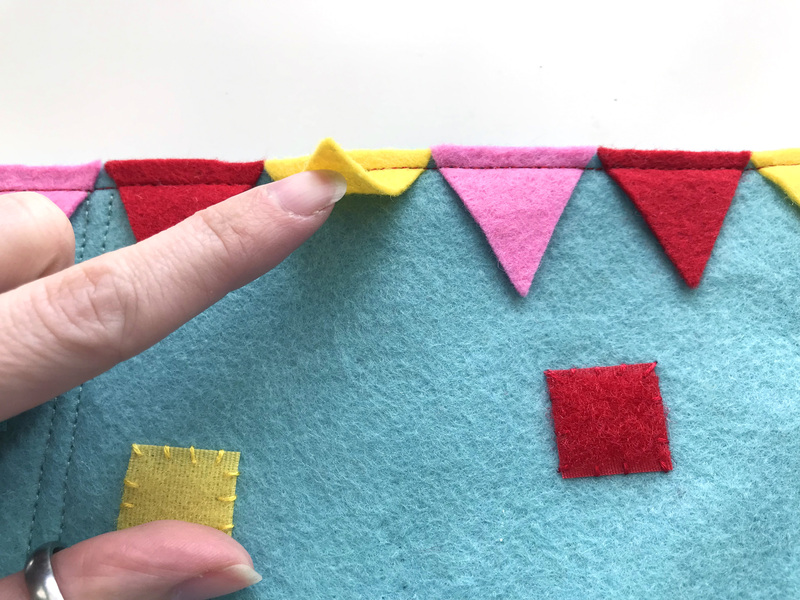 Blanket stitch the fronts and backs together, catching a thin ribbon for the balloon string in your stitching at the bottom. 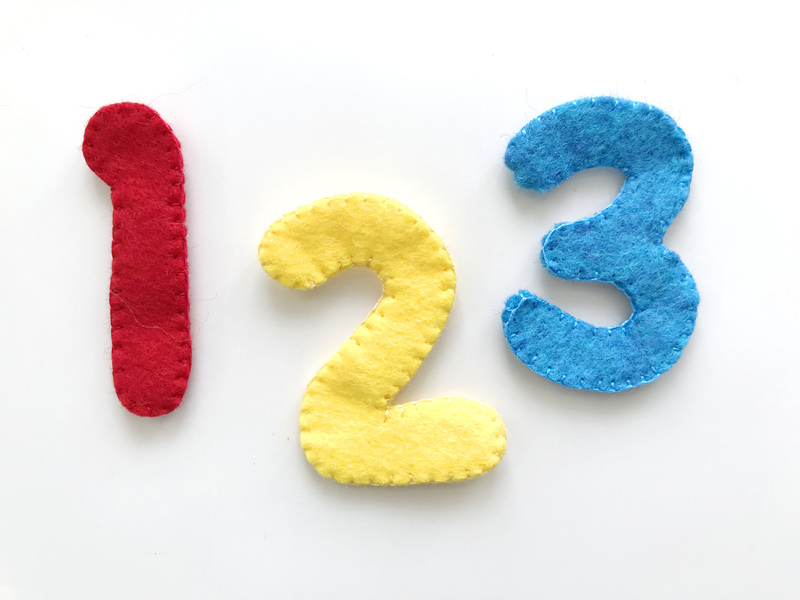 The numbers are done very similarly, but without a string and no hook and loop on the front. You can finish the page however you prefer. 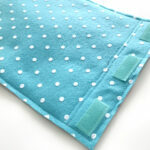 I normally sew a backing on, reinforce the binding edge with a couple rows of stitching, and add three grommet holes. This time I am trying something new. So far, so good! The two pages I’ve done this way are holding together nicely. I’ll definitely need a back cover to stop snagging, though. 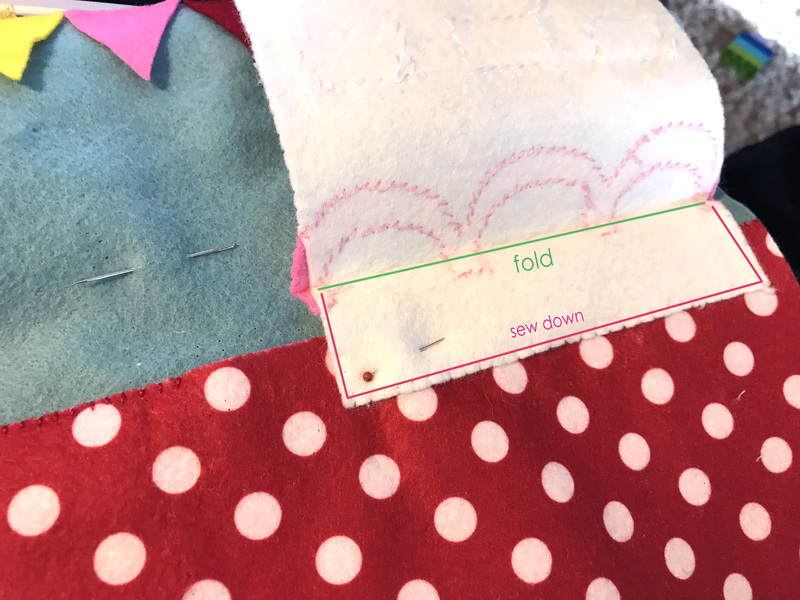 I did everything the same as I normally would, except I sewed three 2″ strips of hook and loop tape to the page and the backing in the binding area. I put the rough side on the backing and the soft side on the page. The idea is you can stack the pages together but the child and separate them easily. I plan to do a cover that will attach to the top and bottom pages in the stack, once I see how big this holiday project ends up. Or maybe I’ll make separate front and back covers… We’ll see how it goes! If you sew along with me on this holiday project, please tag me on any Instagram photos you post! My IG is @iolstephanieand you can use the hashtag #imagineourlife. You can also post to my Facebook page. I love our little community there and I hope we can all be more active in 2019! I’m not the best at social media as I try to spend my time creating. I don’t even watch tv, as I’d need more hours in the day!! Something fun we’ve been doing is daily vlogging on YouTube! I include clips of sewing projects whenever I can. Please subscribe here, and click the bell to be notified of new videos. I post every night! 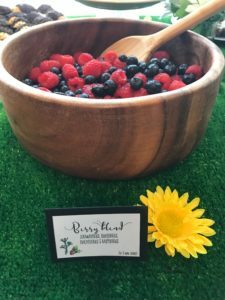 Leave a comment to let me know you came from the blog! A Valentine page is up next! I’ll see you soon with that! 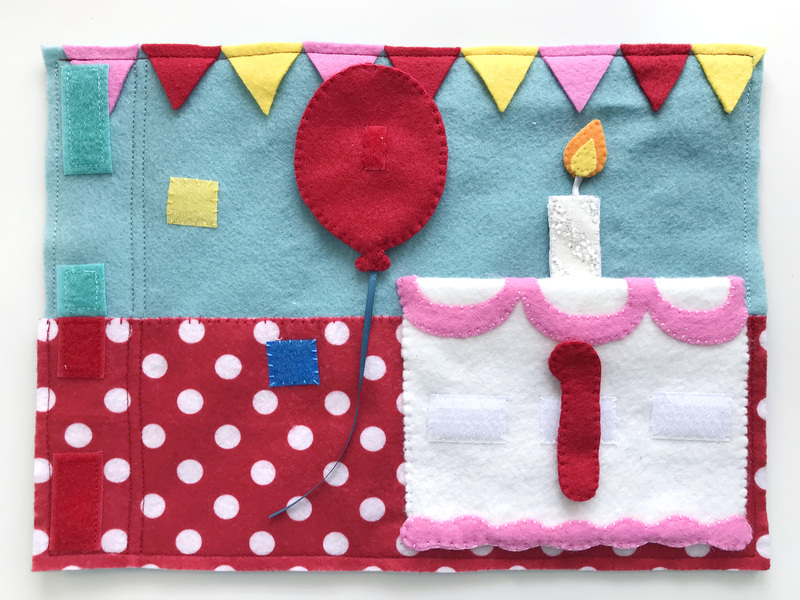 This entry was posted in Quiet Book and tagged birthday, Holiday Quiet Book, Quiet Book, Sewing on January 29, 2019 by Stephanie. Hello friends! I’m so excited to finally have some quietbook patterns in the works for you. And, right before New Year’s Eve, I was inspired to start a holiday quietbook for Sebastian. 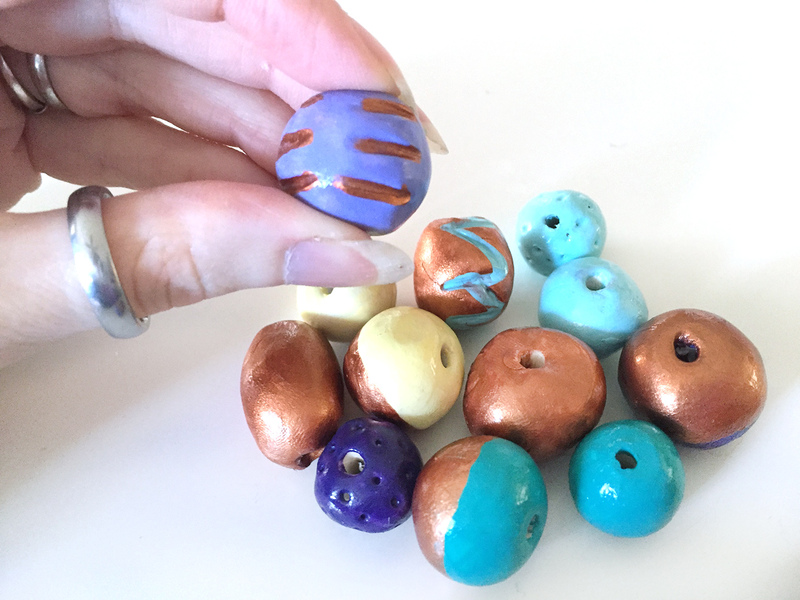 I plan to regularly release quick holiday patterns (all free!) so you can sew along with me. This pattern features New Year’s Eve. 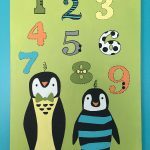 It has numbers to match, snaps to close, a NYE ball to “drop” and sequins that encourage little fingers to trace, much like Montessori sandpaper letters do. There are also two fireworks that add fun textures to feel. 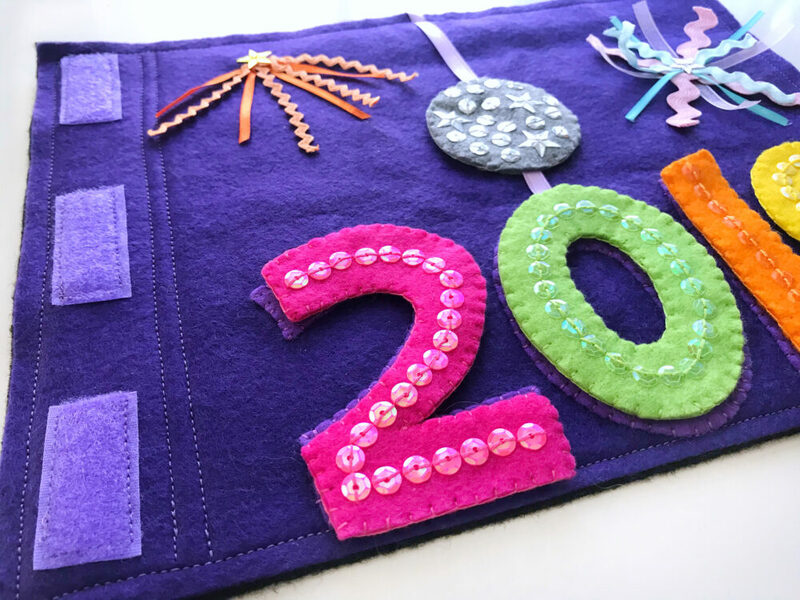 To make each of the number pieces, start by sewing a line of matching sequins down the middle of the front piece as shown. 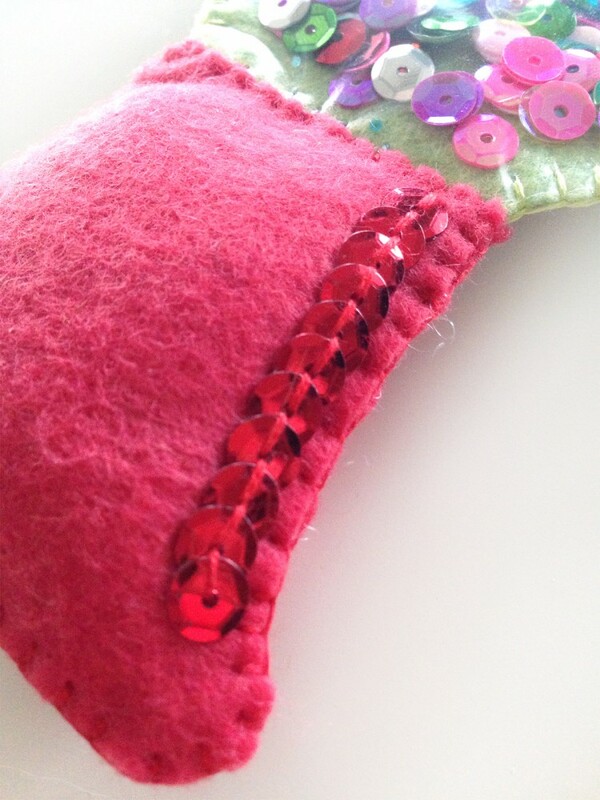 I like to make two stitches for each sequin. It looks like back stitch when they are all lined up. Sew a snap to the backing piece. I usually put the female side on the page and the male side on the loose piece. 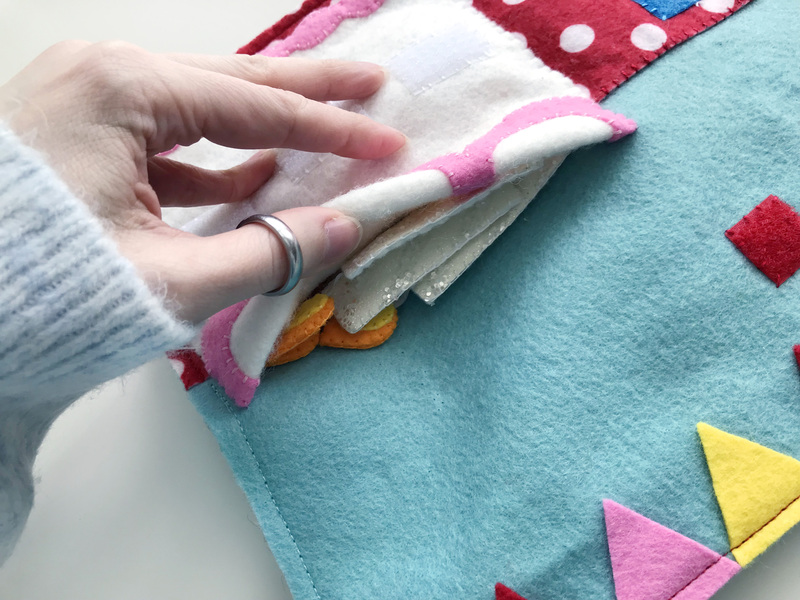 Use blanket stitch to sew around the edges of the piece. You can definitely chose any color you’d like for the numbers. I let Sebastian choose. But it would look amazing in colors like black/silver/gold! 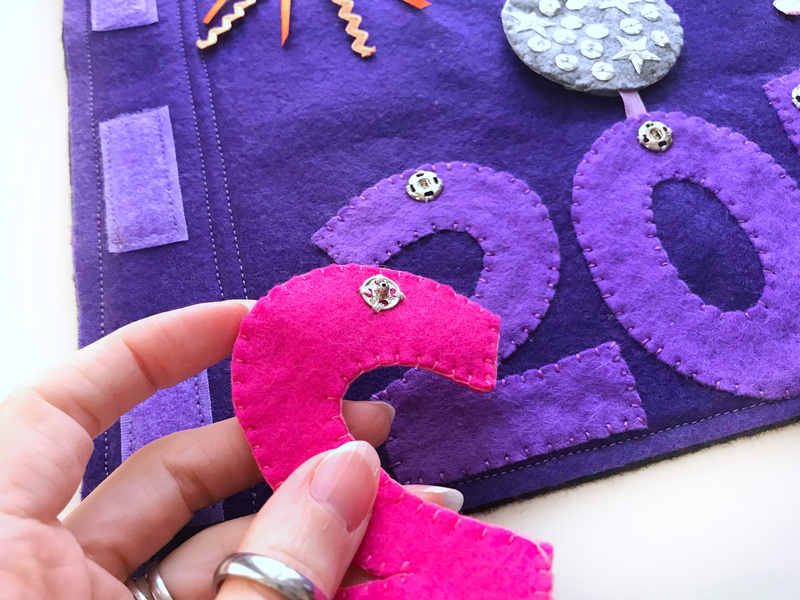 Allowing about 2″ on the side for the binding, sew down the purple numbers. Make sure to catch the end of a ribbon under the top of the 0. It need to be long enough to go past the top of the page. Sew the other half of the snap sets to the numbers, making sure they line up. 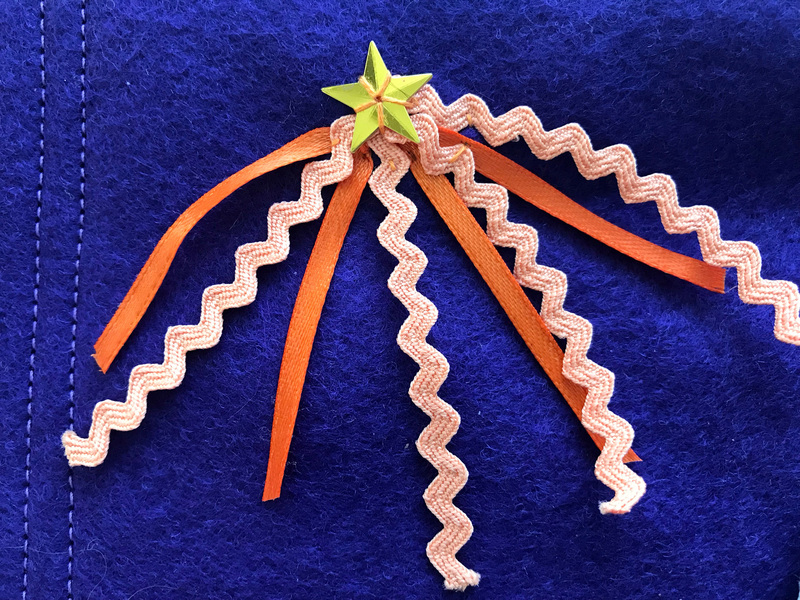 The orange firework is created by folding a bundle of 4″ – 5″ ribbons and ric-rac in half, stitching them down, and sewing a star sequin on top. 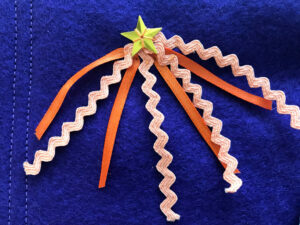 I used two pieces each of orange mini ric-rac and ribbon. 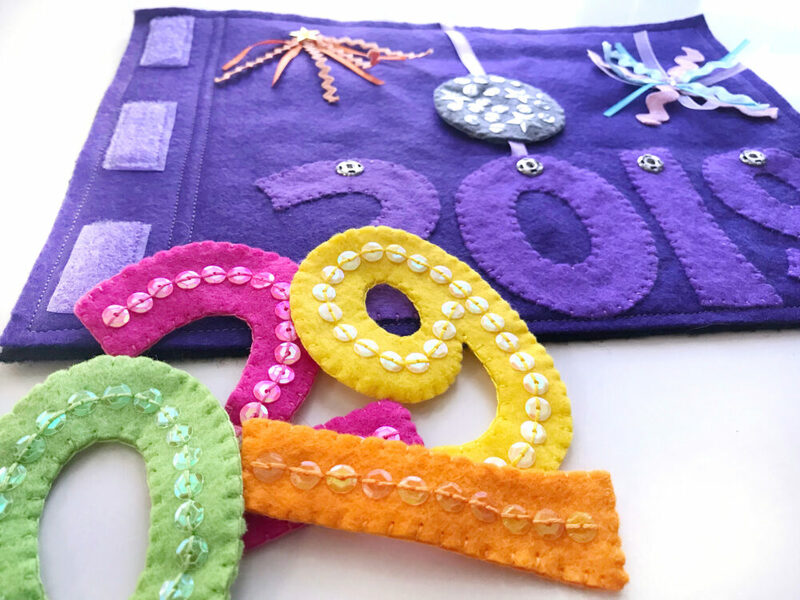 The pastel firework uses 3″ – 3.5″ ribbons and ric-rac laid out in a starburst shape with a star sequin sewn onto the intersection. 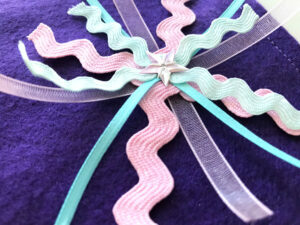 I used two pieces each of pick and blue ric-racs and two each of pink and blue ribbons. Choose and color combination you’d like for the fireworks! They are good for using up ribbon scraps. 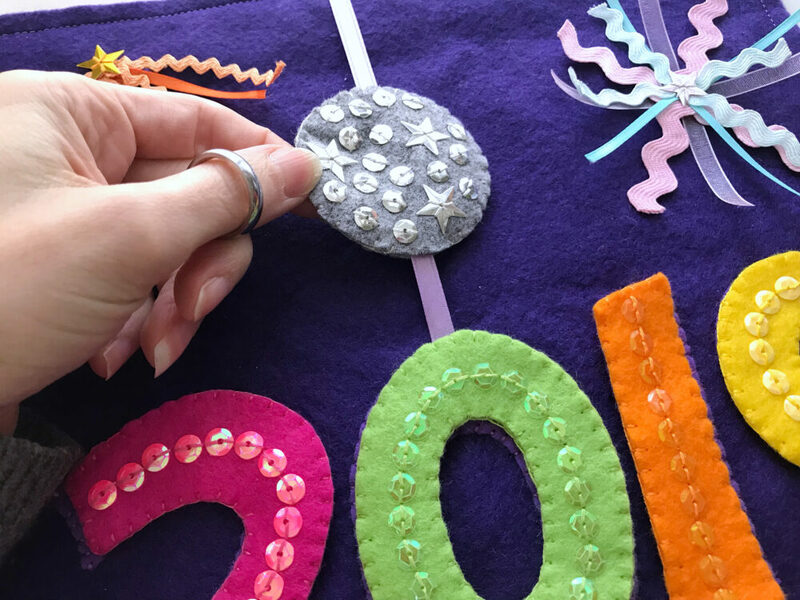 Start by sewing silver sequins to the front piece. I added 3 star sequins for extra sparkle. 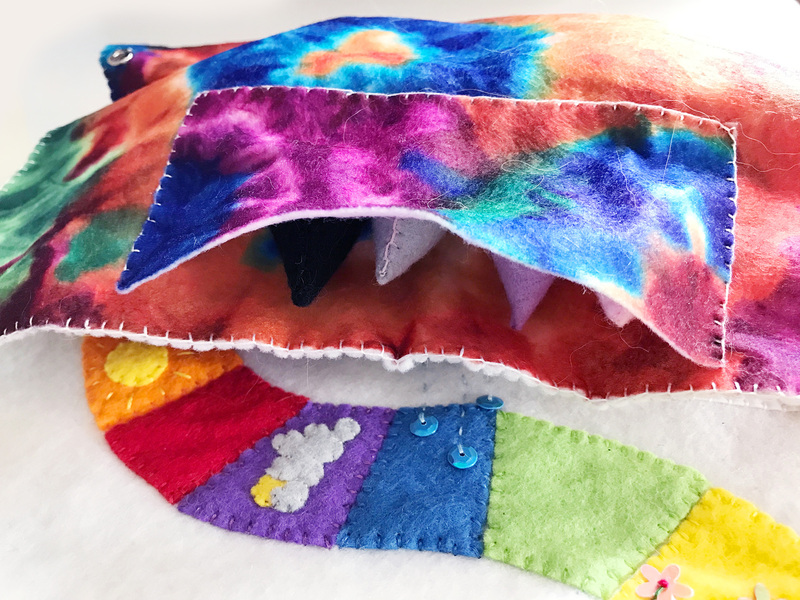 When sewing the front and back pieces together, you will need to leave a tunnel for the ribbon the slide freely through. I started my blanket stitch a bit off-center and continued just short of halfway around (see diagram). I then blanket stitched across the ribbon opening only through the top layer. I wrapped the piece around the ribbon before sewing the other side (leaving a gap at the top for the ribbon to come out) so I didn’t have to thread it through later. Along the top ribbon opening, I again blanket stitched only through the top layer. This made the stitching look consistent and gave the openings a bit more strength. Your finished ball should slide up and down the ribbon easily. You can finish the page however you prefer. 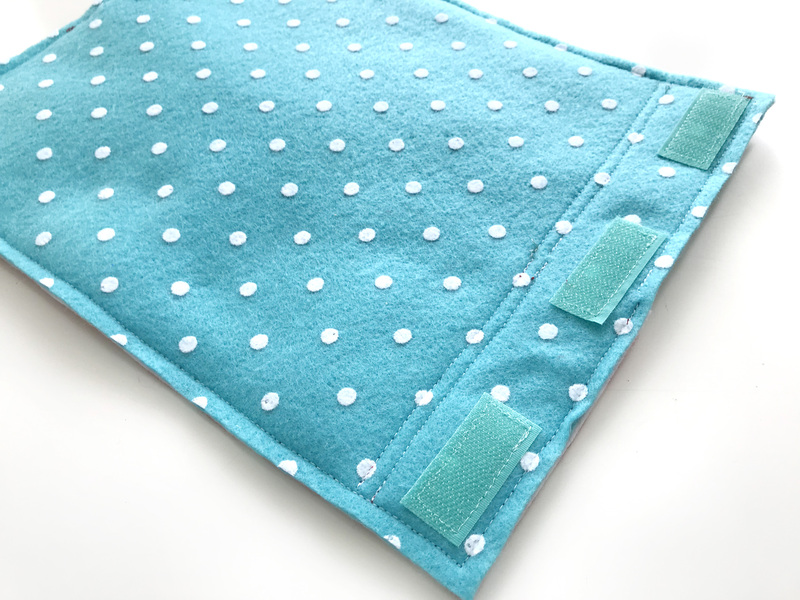 I normally sew a backing on, reinforce the binding edge with a couple rows of stitching, and add three grommet holes. This time I am trying something new. I haven’t tested it yet so I can’t let you know how it goes yet! I did everything the same, except I sewed three 2″ strips of hook and loop tape to the page and the backing in the binding area. I put the rough side on the backing and the soft side on the page. The idea is you can stack the pages together but the child and separate them easily. I plan to do a cover that will attach to the top and bottom pages in the stack, once I see how big this holiday project ends up. Or maybe I’ll make separate front and back covers… We’ll see how it goes! If you sew along with me on this holiday project, please tag me on any Instagram photos you post! My IG is @iolstephanie and you can use the hashtag #imagineourlife. You can also post to my Facebook page. I love our little community there and I hope we can all be more active in 2019! I’m not the best at social media as I try to spend my time creating. I don’t even watch tv, as I’d need more hours in the day!! Something fun we’ve been doing is daily vlogging on YouTube! I include clips of sewing projects whenever I can. Please subscribe here, and click the bell to be notified of new videos. I post every night! Anyway, I hope you enjoy making this quick little page! I’d say the slowest page is the sequins, but they aren’t too bad. They really add a lot to the page. 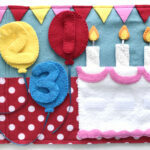 I’ll see you soon with a birthday-themed quietbook page! 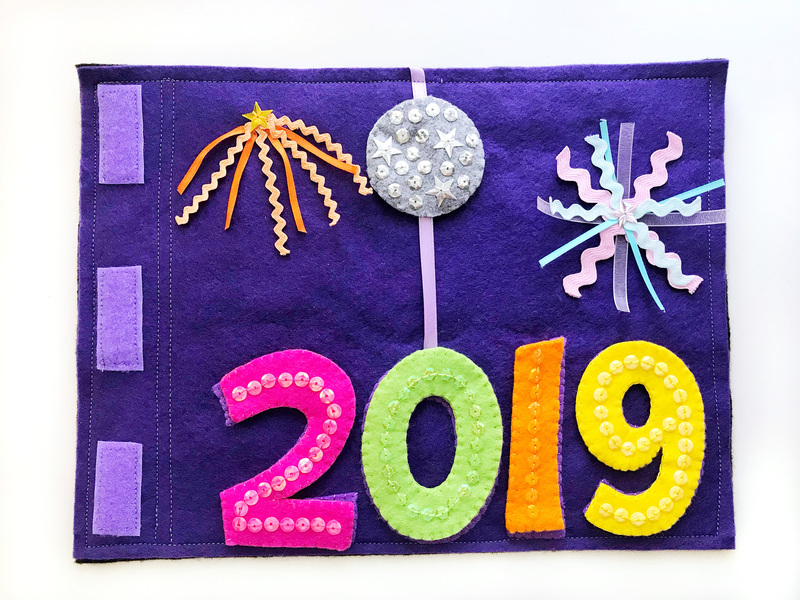 This entry was posted in Quiet Book and tagged Holiday Quiet Book, New Year, Quiet Book on January 8, 2019 by Stephanie. It’s bittersweet having my first born outgrow quiet books. Thankfully, my toddler is ready to use them, so I’ve begun sewing a new batch! 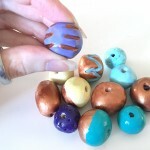 I can’t wait to share those with you… But, that lead me to ponder: what can I make for the 6 year old and up age range? Board games! 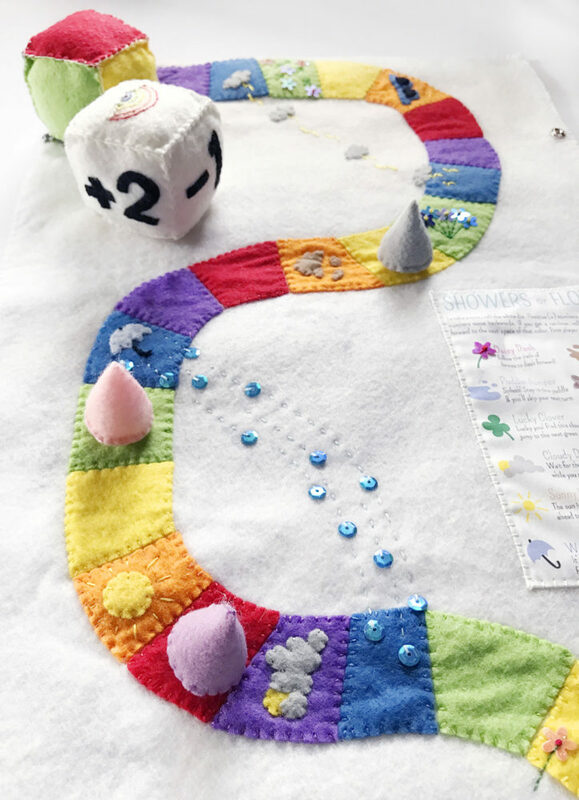 Showers or Flowers is a sweet felt game that is fun for all ages! 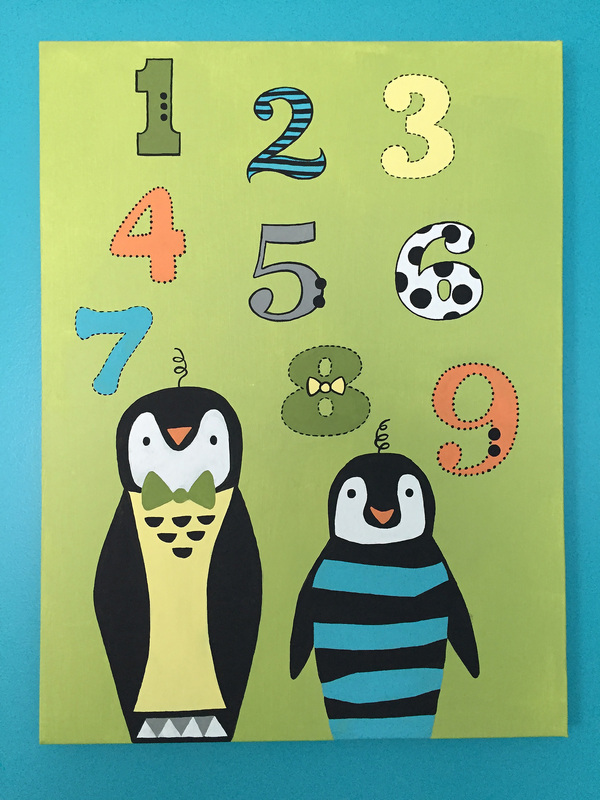 It features simple counting and colors. It’s a beautiful heirloom that folds up small and portable just like a quiet book page. I can see it being great for travel, waiting rooms or just a fun family night! To play with your older child, roll the white die to see how far you move. If you get a rainbow, roll the rainbow die and move forward to the next space of that color. Use the instruction chart if you land on a special space. Have a little one who wants to play too? 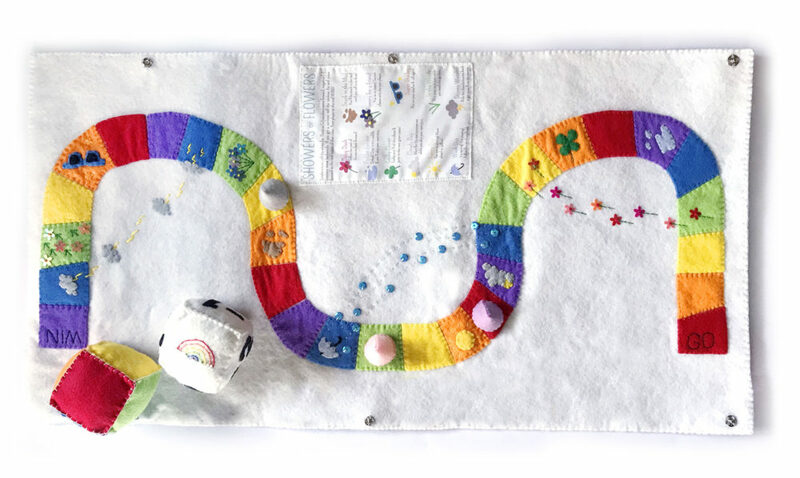 Use only the Rainbow die to play the toddler version. First one to the finish line wins! This is a pay pattern available in my Etsy shop. 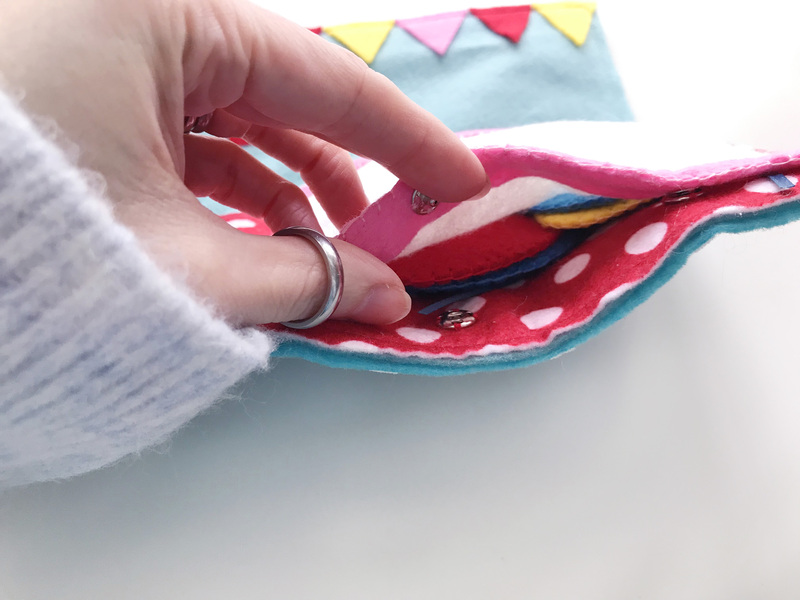 Purchasing my pay patterns will let me move towards making a living at crafting and give me more time to devote to both pay and free projects. This is my goal over the coming year! I really need to make this happen and am so grateful for your support!! I hope you’ll find the pattern files to be clear and helpful! Many hours have gone in to creating and editing them. The pattern includes a stitch guide and full tutorial with photos and illustrations. There is also a page with the printable instructions (for printer fabric, or laminated paper.) 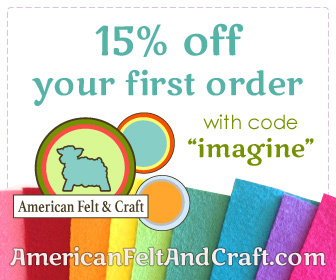 You will also receive a coupon for $5 off at American Felt and Craft to help you get started on your felt stash. 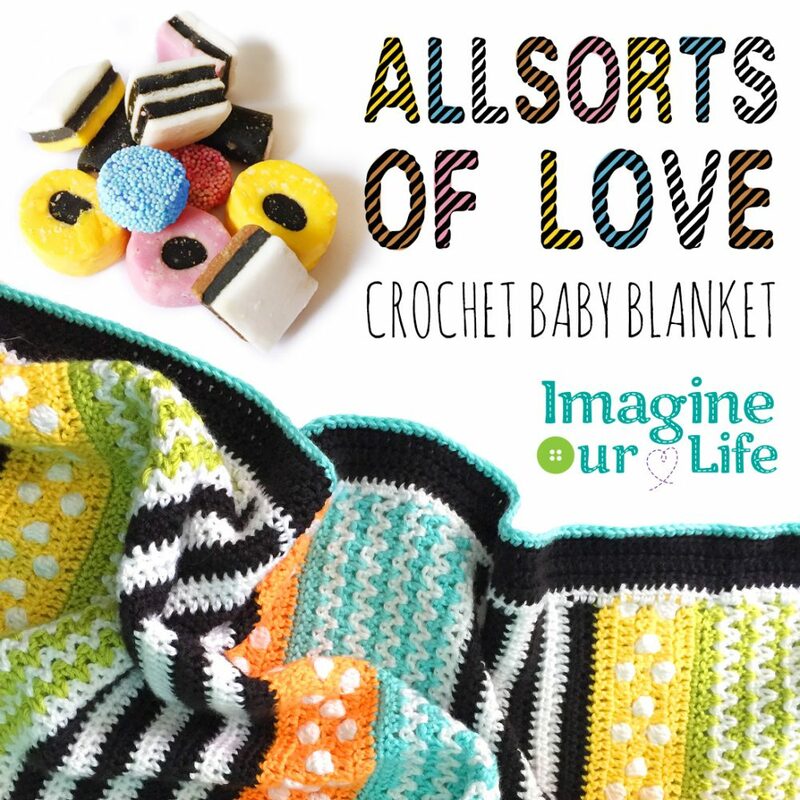 You can purchase this pattern for $6 in my Etsy shop, Imagine Our Life. If you would like to sell the finished product, you can purchase commercial licensed version for $20 (coming soon this weekend!). This is a one time fee, and you’d be able to sell as many Flowers or Showers games as you’d like after purchasing it. I really hope you enjoy this pattern! I would love to design more board games if this one is enjoyed. Please stop by our Facebook page to let me know what you think! 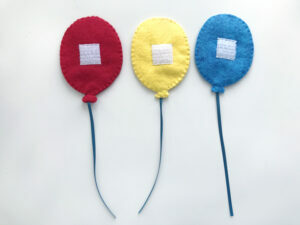 I have several free and pay quiet book projects underway at the moment. I’ll post some sneak peeks on Instagram. Come follow along! 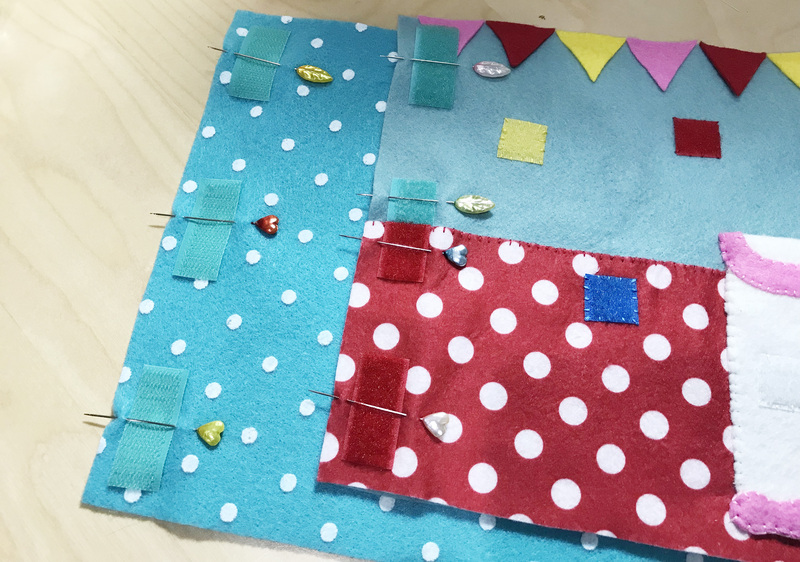 This entry was posted in Board Games, Quiet Book, Sewing on August 17, 2018 by Stephanie. 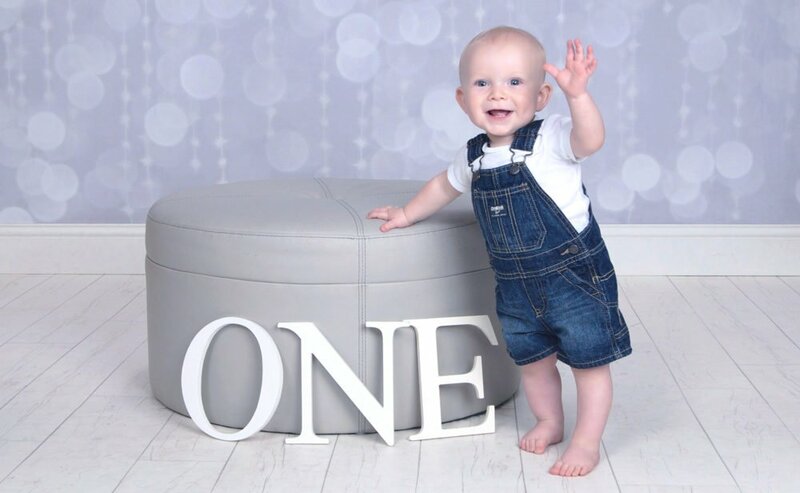 My baby is 1! Oh, it’s so bittersweet… My sweet final baby is now a year old, walking, and beginning to talk. I refuse to switch to saying “toddler” until 2 – what about you? While it’s sad that time is going so fast, I’m also excited for the things to come. Like soon I’ll have a new little one old enough to design quietbooks for! 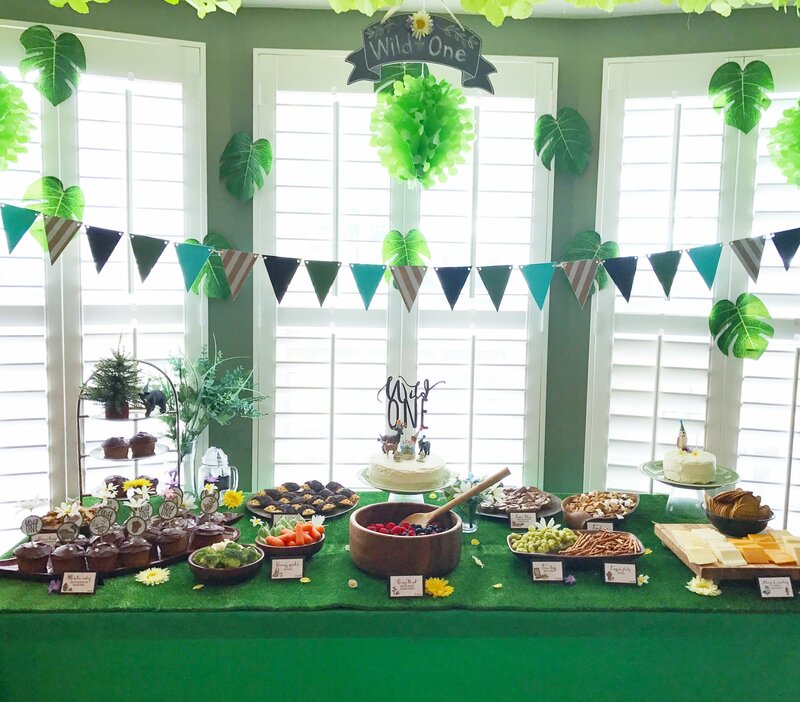 We hosted a party for Sebastian and I chose a woodland theme because he loves owls and I loved the idea of “Wild One”. I mainly focus on decorating one portion of our kitchen at parties now, due to limited time. I start a week or two in advance and pick away after baby goes to bed. The food table has two cheap green tablecloths (they were fairly see-through) and an artificial grass runner from Amazon.I got the 8′ runner for $13. I pulled flowers off of dollar store bunches and spread them around. The three tissue balls were $2 each from Walmart, and the fabric leaves and dollar store cake stands were leftover from Jax’s bug party.The chalkboard sign was from AC Moore, I think. I was bummed because the chalk wouldn’t write on it at the center top, but I ended up gluing fake flowers there. All of the wooden trays and bowls were thrifted, with the exception of two faux wood chargers from Walmart for $1 each. I hand cut the bunting and cake topper. The tiny tree was from Amazon, but no longer available. 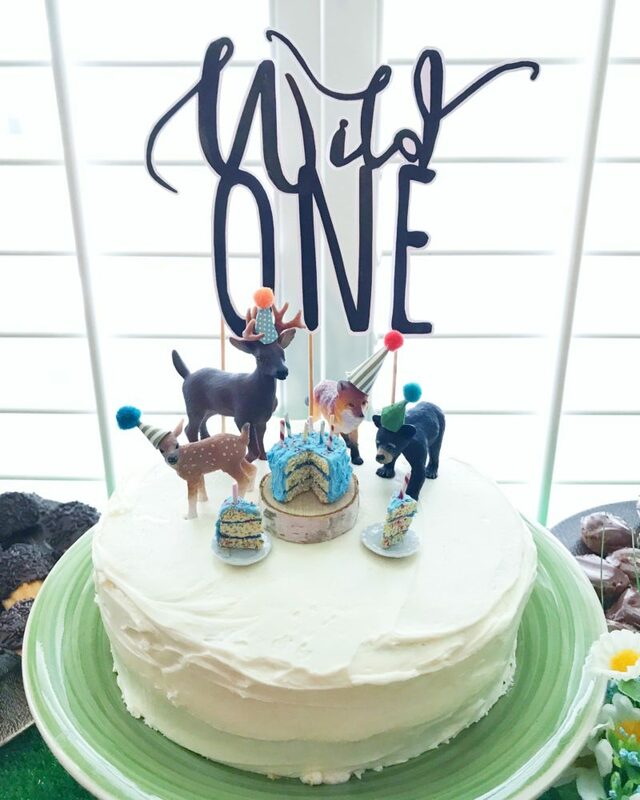 Because I had very little party planning time (busy baby is busy! ), I purchased illustrations this time from Etsy. The woodland and bakery clip art was from Le Petite Market’s store. The two fonts I used were from Creative Qube Design’s store (90% off sale!) I designed the tent cards and cupcake toppers in Indesign, cut them (I used a circle punch for the picks) and mounted them on card stock. 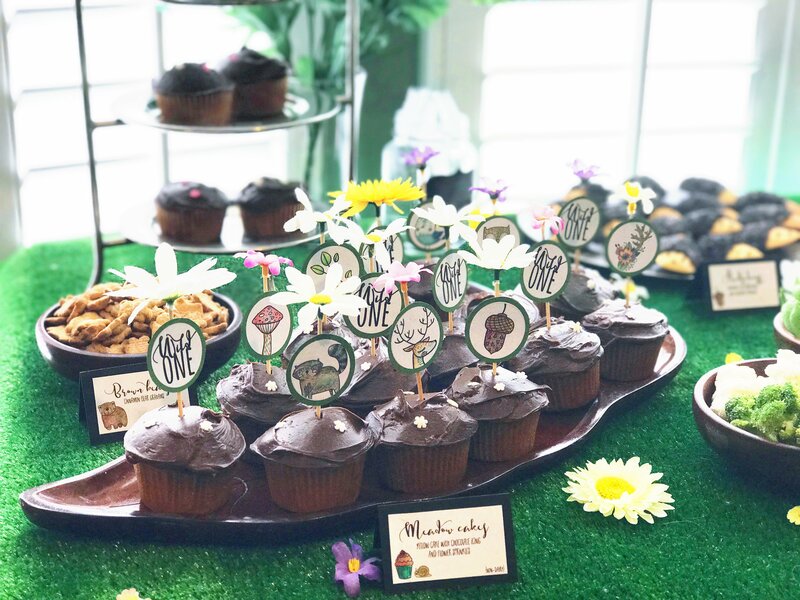 I hand-colored the cupcake picks with colored pencils, and they got mini kabob sticks (point cut off) and fake flowers as well. 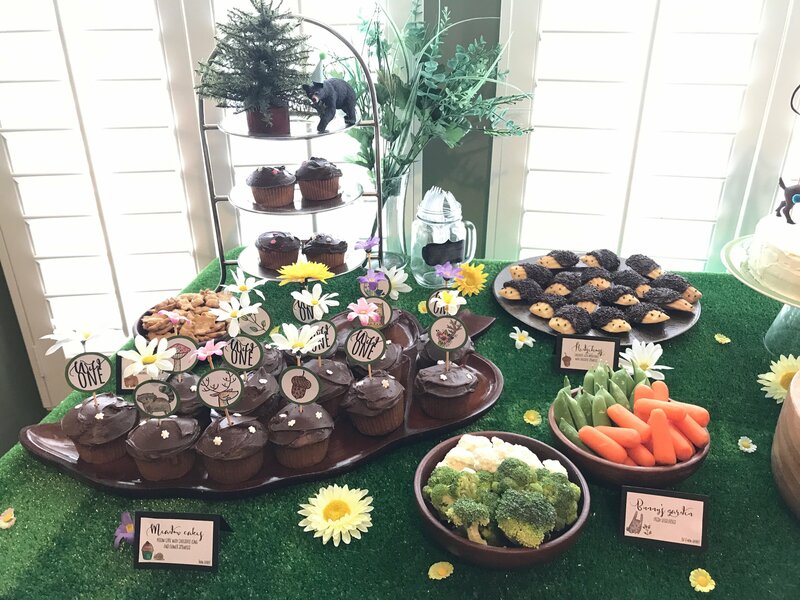 Some of the food pictured here: Meadow cakes (yellow cupcakes with chocolate icing and flower sprinkles), Brown bears (cinnamon Teddy Grahams), Bunny’s Garden (fresh veggies) and Hedgehogs (chocolate iced madeleines with sprinkles. 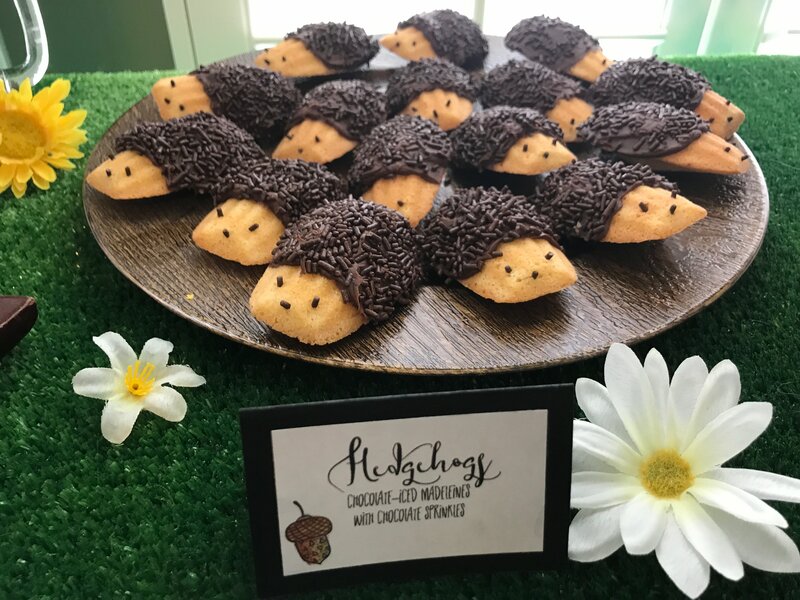 The hedgehogs came out so so cute! To make the faces, I stuck sprinkles into the cookies for eyes and mouths. 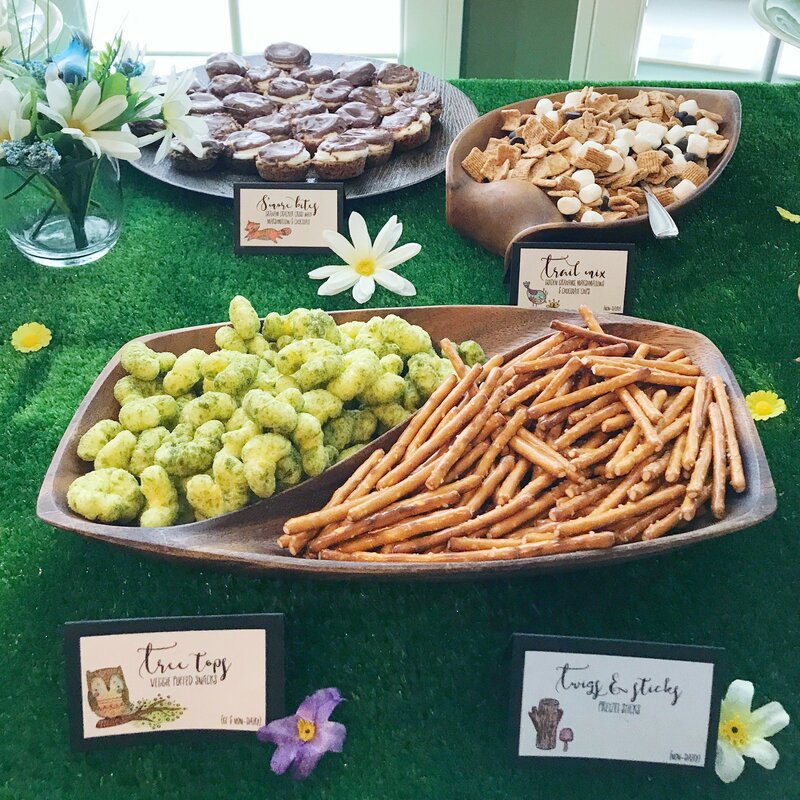 More food pictured here: S’more bites (baked by my friend), Trail mix (Golden Grahams, mini marshmallows and chocolate chips), Tree tops (Pirate Booty) and Twigs & Sticks (pretzel sticks). 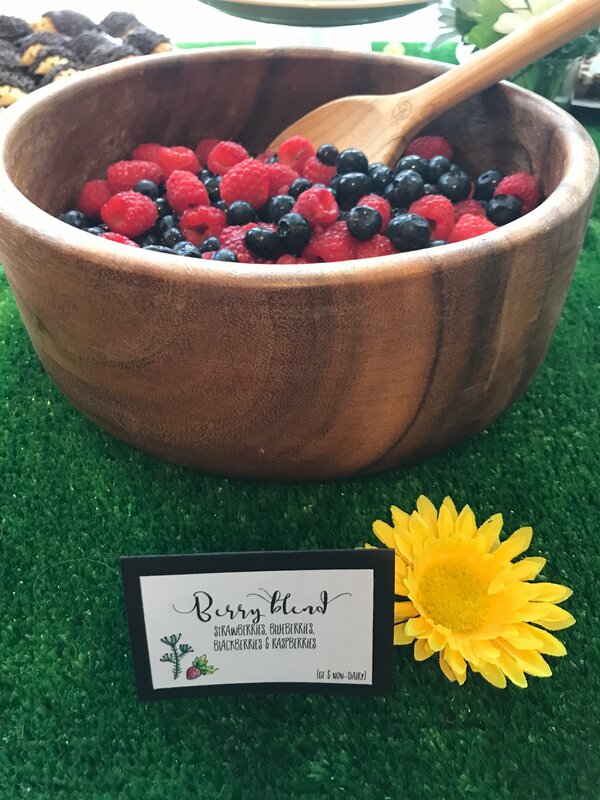 Even more food pictured here: Berry blend (Sebastian’s favorite fruits) and Cheese and Crackers (yep). The cake was a lemon strawberry swirl cake with vanilla icing and fresh strawberries between the layers. I just swirled two cake mixes. I level the layers and did a crumb coat, but that was the extent of my fancy decorating! 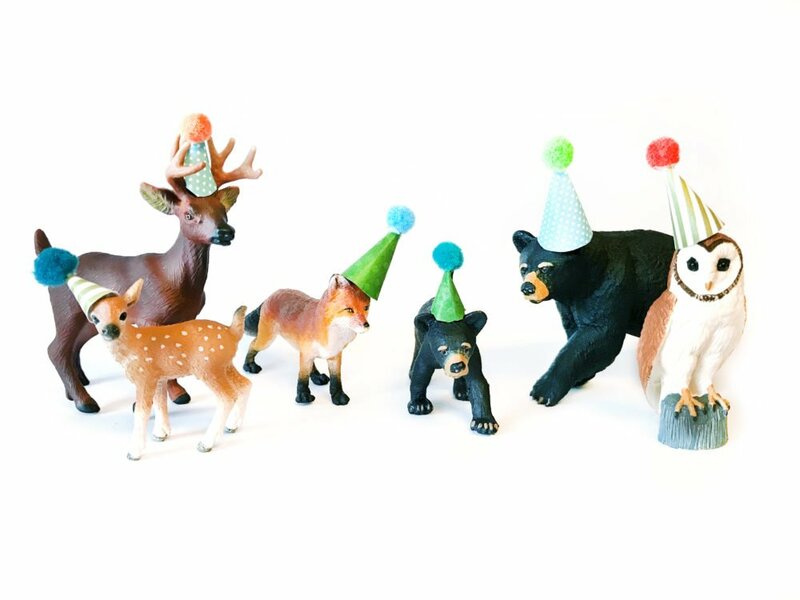 I bought toy animals and made tiny party hats for them out of paper and mini pompoms (from my stash, so some I dyed with sharpies). I purchased a miniature cake from Etsy to put on top with them. I made a smash cake for Sebastian (who didn’t really eat it, but oh well!) that was the same flavor. 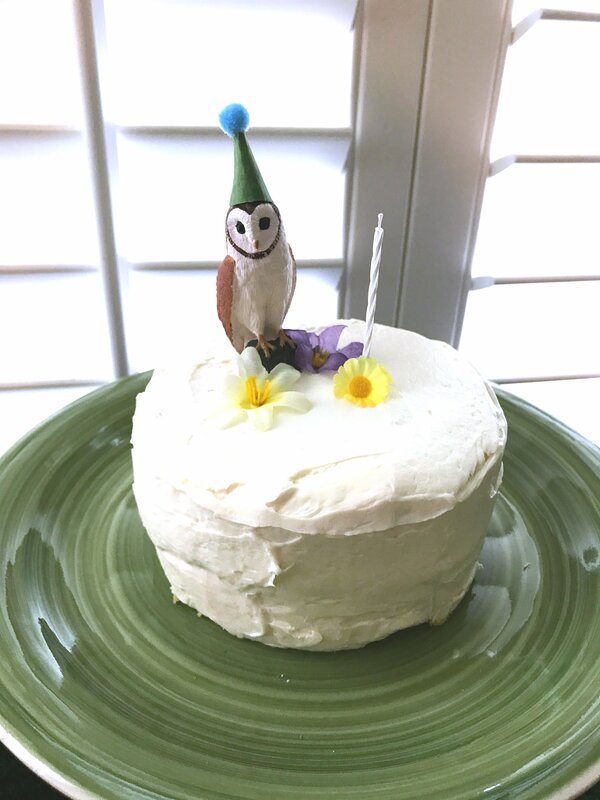 I put the owl on top, as well as a candle (we didn’t light) and some flowers. My year-long project of photographing Sebastian was a feature wall. 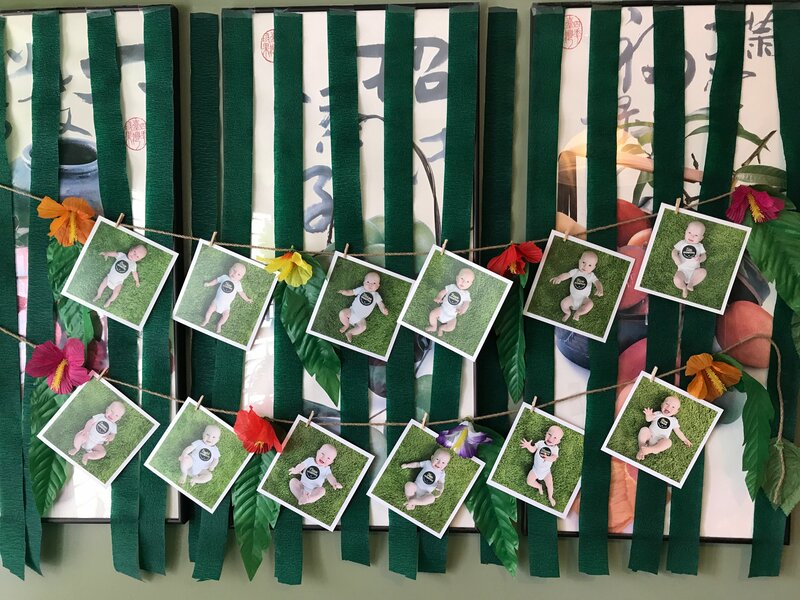 I covered the art we have hanging with green streamers (funny story…) and hung flower garlands from Jax’s 3rd birthday party. I used mini clothespins my husband found on Amazon to hang my prints. I bought two poster prints that had all of the monthly photos laid out in a grid from Vista Print, then cut them out. 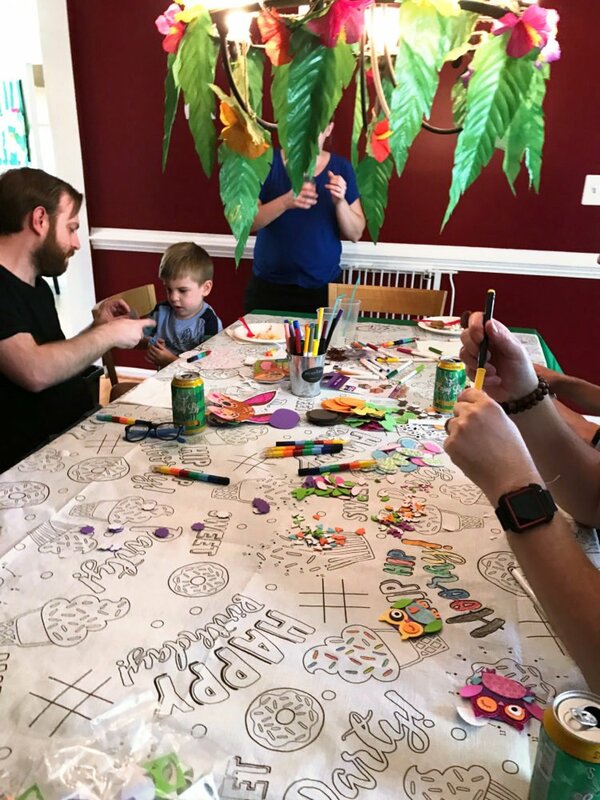 I always do a craft table and this one was a bit last minute. I ordered foam owl sticker sets and color your own woodland masks. Both worked great at the party! The party favors were fairly simple, as I’m not a fan of getting lots of plastic junk in favor bags. 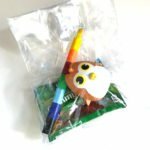 Kids over 3 got rainbow stacker crayons from Target, a pack of gummy bears and an owl water squirter. Babies and toddlers got baby bath toys and a pack of Teensy Fruits. I know that first birthday parties are more for the parents, but I hope Sebastian felt how loved he is! We had a great time celebrating our littlest man. We love him so! Here is Sebastian’s wishlist for those who have asked. A little late, sorry… You are sweet to think of us! 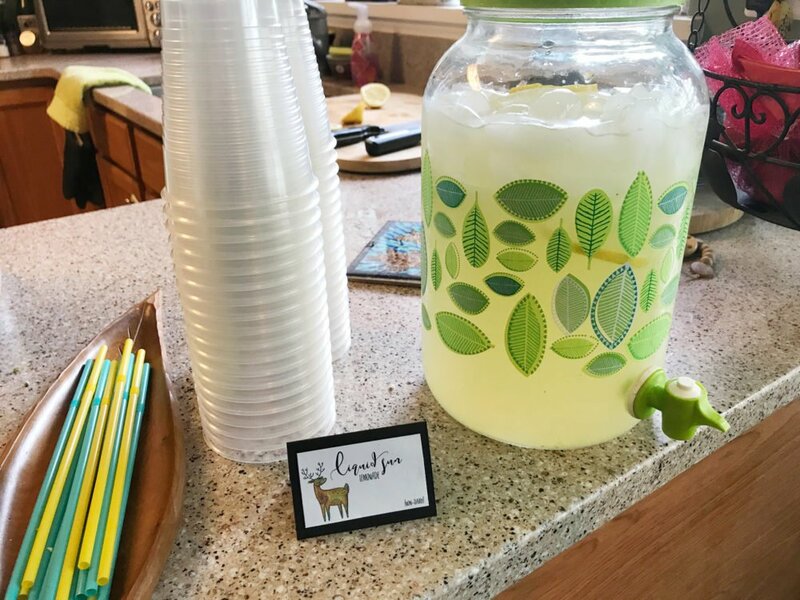 This entry was posted in Have Some Fun, Party Ideas on July 26, 2017 by Stephanie. Valentine’s Day marked 8 months of having baby Sebastian here with us. 8 months of dimpled smiles. 8 months for sweet breastfeeding snuggles. 8 months of being a mama to two sweet boys. And, 8 months of daily shots. Sebastian’s birth was easier on me than Jax’s. I didn’t need Pitocin and everything progressed steadily on its own. When it was time to push, he was out in 10 minutes because his heart rate was dipping with every contraction and I wanted him safely out. He was healthy and beautiful. The hospital was amazing about skin to skin and breastfeeding time right away. We had quiet time to meet him and decide his name. We spent one night after his birth and got permission to leave late the next day. The next day, as we rushed to go to Jax’s science class graduation with our newborn, I suddenly felt funny. The room spun, my arms moved in stuttered slow motion and I couldn’t get my mouth to move. It was like a bad dream when you can’t speak or run away, but it was real life. It only lasted a few seconds. I called my OB’s nurse from science class and she suggested I was tired and hungry, but to watch for it to happen again. Later that evening my left hand went numb and tingly. I was sore from nursing and assumed I’d pinched a nerve. It became clear when I woke up the next morning that it was much more serious than that. I couldn’t move the lower left side of my face much. After a hot shower while my big boys slept to help me build up courage, I called my OB again. She sent me to the ER. After hours of tests, doctors and uncertainty, they confirmed that I’d had multiple mini-strokes (TIAs) based on tiny infarcts seen on my MRI. It being Friday, I was told to expect to be there all weekend waiting on testing. Imagine being told you’re getting admitted back into the hospital while holding your 3 day old baby you’re determined to breastfeed. Luckily, they did not stop us from keeping Sebastian with us. We just had to always have an adult with me in case I was taken off for testing without warning. (And I was.) They provided a bassinet from the mom/baby floor and my OB visited and had postpartum supplies and a pump sent to my room, as I had nothing and the PICU was not at all prepared for my situation. I stayed in the hospital Friday through Monday, begging each day to go home. I missed Jax so dang much!! I had many, many tests. Every sort of heart, head and neck scan possible, it seemed. So many blood draws that once a second blood cart arrived within minutes of a big draw and I sent her away because I was near tears from being overwhelmed. Everything was looking normal, besides my brain, but they wanted a closer look at my heart. Clots normally go to the lungs, from the heart – not the brain. On Monday they put me under general anesthesia and did a TEE (trans esophageal echocardiogram) and discovered a congenital hole in my heart. They have been calling it a PFO, the slightly milder type, but the cardiologist says it acts like an ASD, with blood mixing back and forth between my heart chambers constantly. This is how the clots found a way through to my brain. Happy face because today’s hospitalist just came in and agreed to let me switch to lovenox twice a day and drop aspirin (we were doing it very short term, but no one on my team wants me to nurse on it after they all talked today). I’ll be taught to give myself the shot tomorrow after my procedure. I assume there is still a chance the EE will show something that requires aspirin, and then that’s the end of nursing. I need to stay alive. Hoping and praying it doesn’t go that way. Oh, and he ordered the iv fluids stopped if I am good about drinking water. My second bff of the day. No one has been able to say why I clotted. 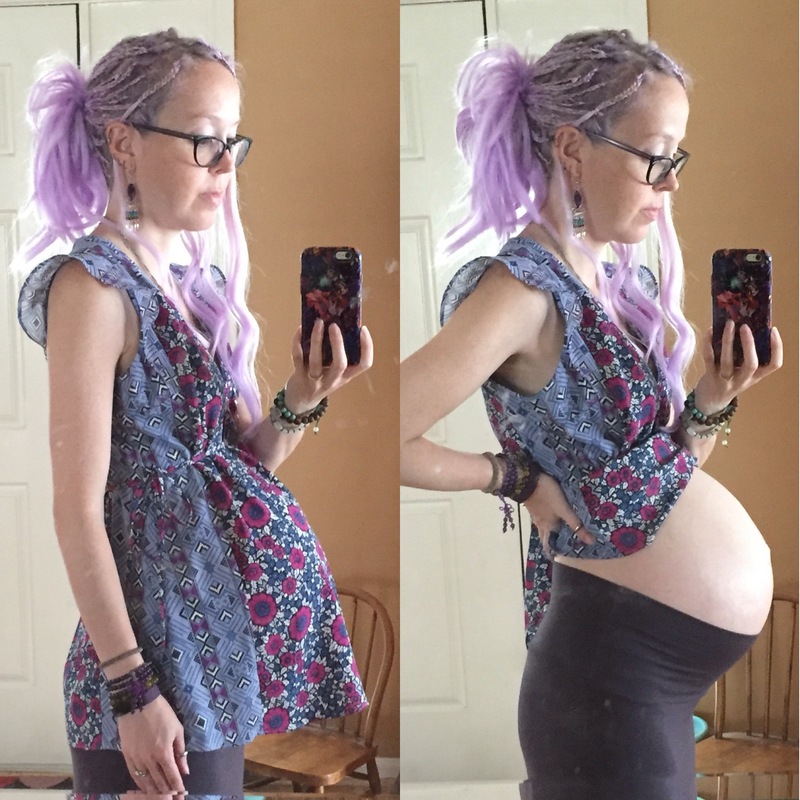 One could guess that pregnancy caused a hyper-coagulated state (thicker blood), as it could. But with additional strokes such a huge risk, every possible blood disorder has been tested for They’ve all been negative. I have been on coagulants that I inject every morning. It isn’t the most fun thing in the word, but other options are less breastfeeding friendly. I may switch the baby aspirin at some point, as a consultation with a breastfeeding and medication expert informed me that if I can wait a few hours after taking it it would be gone from my blood/milk but I’d still get the thinning benefits. This is likely to be life-long. #2016jax366iol July 4th. All about his baby brother today. He was upset when I moved him away. Throughout this all, I’ve felt good. By the time I’d been admitted to the hospital for the TIAs, I’d been down to one fingertip numb and a slight tingly feeling in my cheek. These remain 8 months later. I otherwise feel healthy. Breastfeeding has been a joy and a privilege I won’t be taking for granted. “Oh my gosh, I love our baby so much! I need to kiss and hug Smasher Basher! !” #bestbigbrother #jaxsttackandsmasherbasher ???????????? The part that hurts the most about this is that I am too high risk for any more babies. It doesn’t matter that we’d decided on two… I love babies, and having the what if’s taken away… Oof. But I am blessed! So blessed! Sebastian is a dream come true for me. He is sweet and smiley. The best dimples ever! Jax has been such a good big brother. These two boys complete my heart, even though I never thought I’d be a “boy mom”. I hope this new year has found you well! 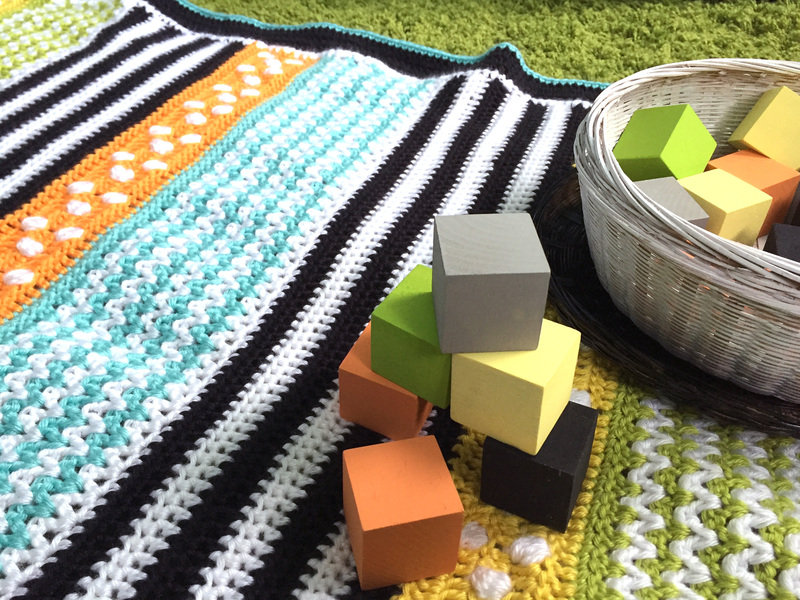 I’ve been crocheting – and now knitting – as it is easier than sewing with a baby in your lap. I’ll be sharing my projects soon! As Sebastian grows, I’ll be designing him his own quietbooks. I’m really looking forward to sharing that chapter with you! 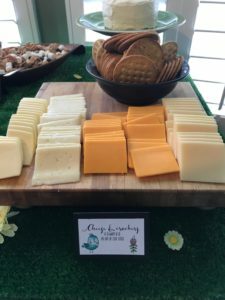 This entry was posted in Personal, Updates on February 16, 2017 by Stephanie. I adore crochet, and while pregnant, I seem to have super speed with it. Jax homeschools, but I enrich his learning with outside classes. That means I have times when I’m waiting outside classrooms – sometimes twice a day. 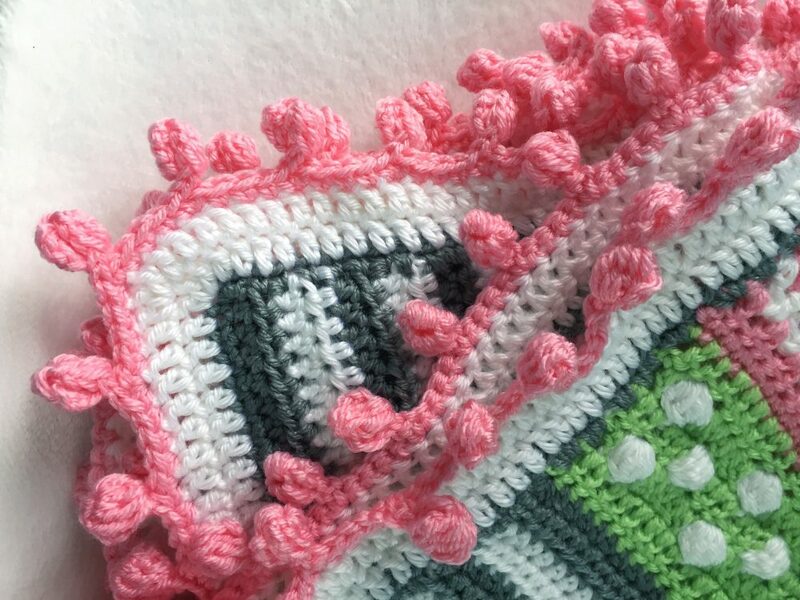 Our nursery bedding was so cute with its fun colors and patterns, that I felt inspired to design a blanket to crochet to match. Let me preface this by saying I can’t write crochet patterns. I’m terrible at keeping track of what I do while I’m crocheting, as I tend to make it up as I go along. I’ll be giving an overview of what I did for each pattern area, as well as the basic materials and starting size I went with. 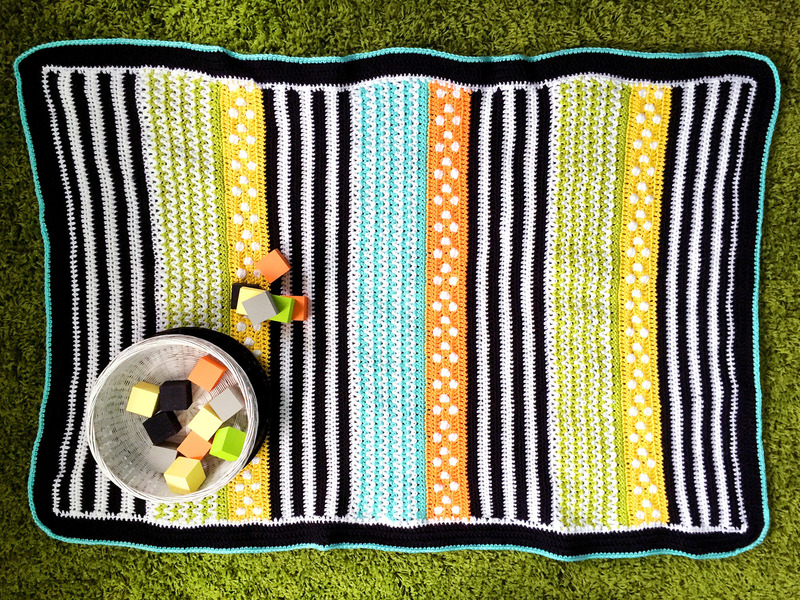 Big thank-you’s to two Instagram friends who helped me name this pattern after fun and colorful licorice allsorts candies! 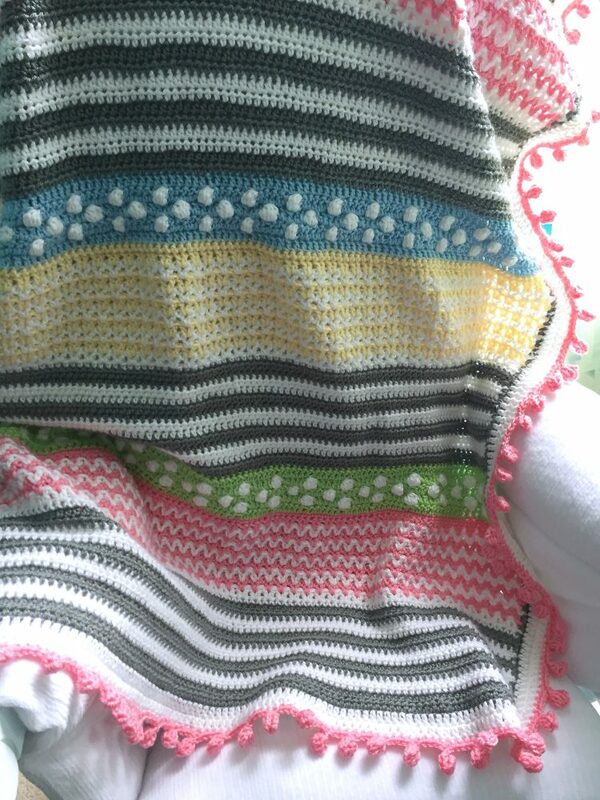 I used Caron Simply Soft yarn in: Black, White, Lemonade, Mango (Brites series), Chartreuse, and Robin’s Egg. I ordered mine from Joann’s during a sale for under $3 each. I used 2 each of white and black, one each of the colors. I did buy an extra skein of each, and have been doing small projects with those. I used this exact 4mm hook, ordered from Amazon. Very comfy! I also used metal yarn needles to weave in the 10 bazillion ends. 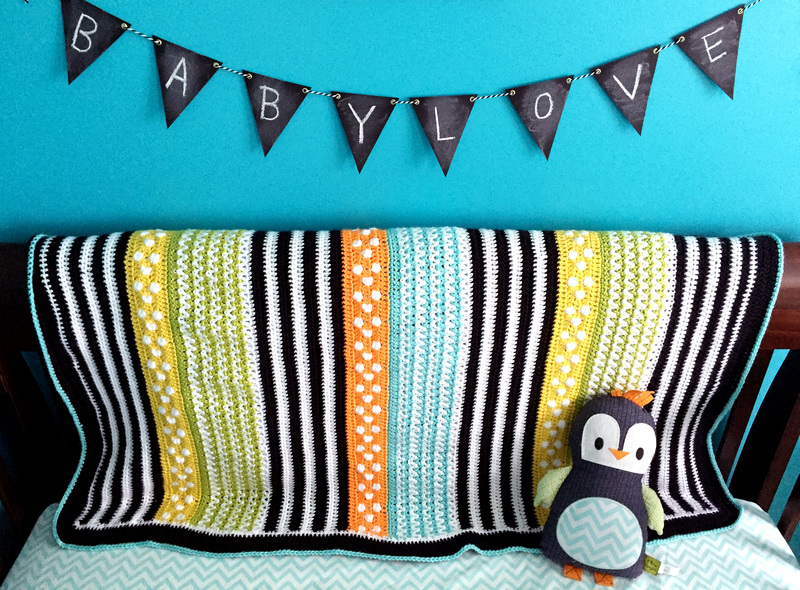 The stripes are made with two rows of hdc, alternating black and white. I did 4 black and 3 white. 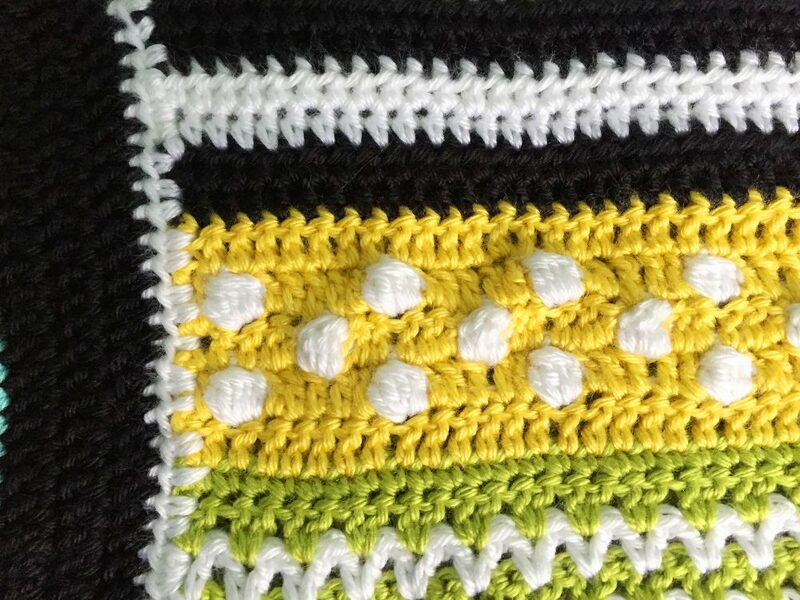 To transition to the zigzags, I did one row of white sc under the final black stripe. 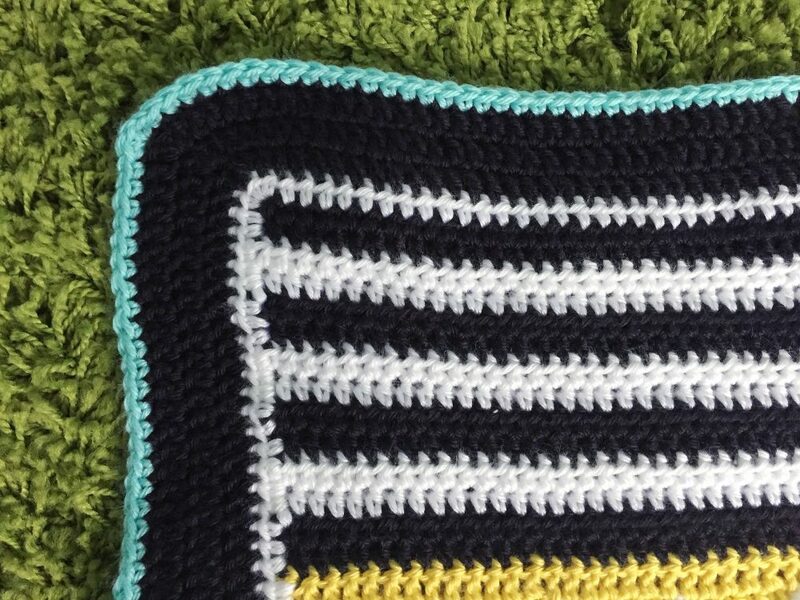 The zigzags are V-stitch. I already had a row of white sc. V-stitch is made by doing 2 dc in one stitch, skipping a stitch, and repeating. In the following rows, make your 2 dc in the space between the 2 dcs below. (I like to start my dc rows with a chainless dc.) 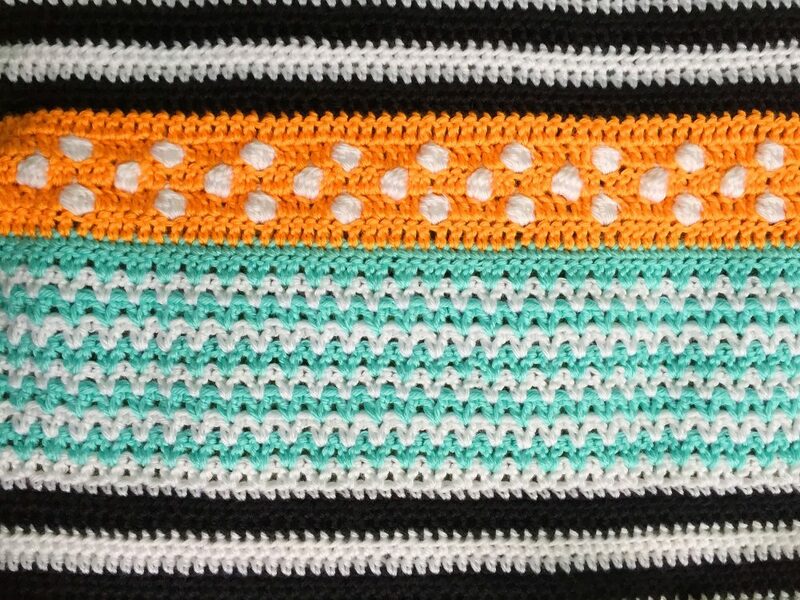 I did 5 rows of white and 5 rows of aqua/lime. After the last row (aqua or lime), I did a row of sc in that color. I started this section with a full row of dc. Row one of the dots was 2 dc in the color, followed by a white bobble stitch and 5 colored dc, repeated across. I ended with 2 colored dc. The middle dot row was 5 colored dc and a white bobble repeated across, ending on 5 colored dc. The final dot row is the same as the first. I ended the section with a full row of dc. Here is what I ended up doing (from the bottom up). This blanket came out so colorful and fun! 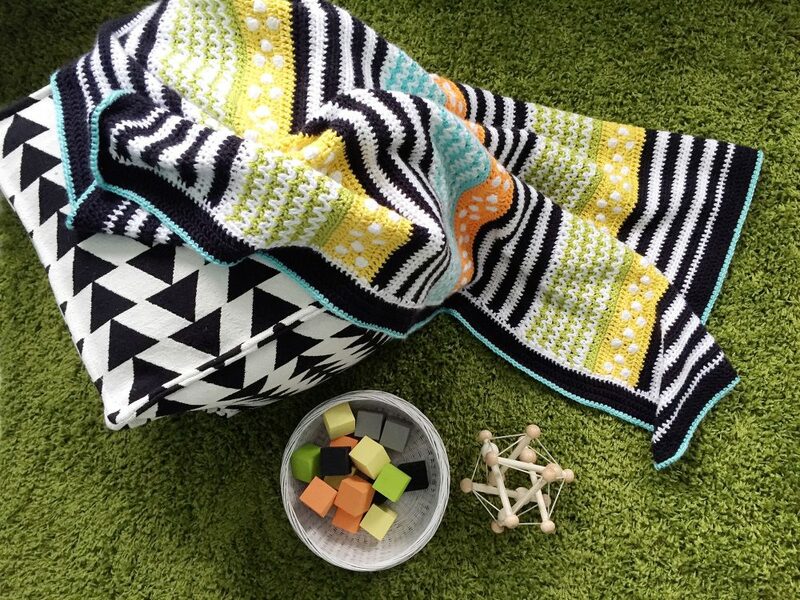 And it is a very versatile pattern in terms of colors and the order of the sections. 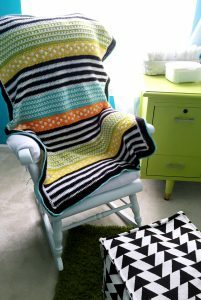 I was so excited to have the opportunity to also make a girlie version of this blanket as a gift. Being on my second boy, there isn’t a lot of pink in my life, so this one was a lot of fun! I made the body of this blanket the same way as the original, but changed the colors around. Black was swapped for grey and pink for the orange. I rearranged the colors so pink and yellow were featured. The yarn for this one is Knit Picks Brava Worsted. You really could do anything on the border to change the whole feel of the blanket! 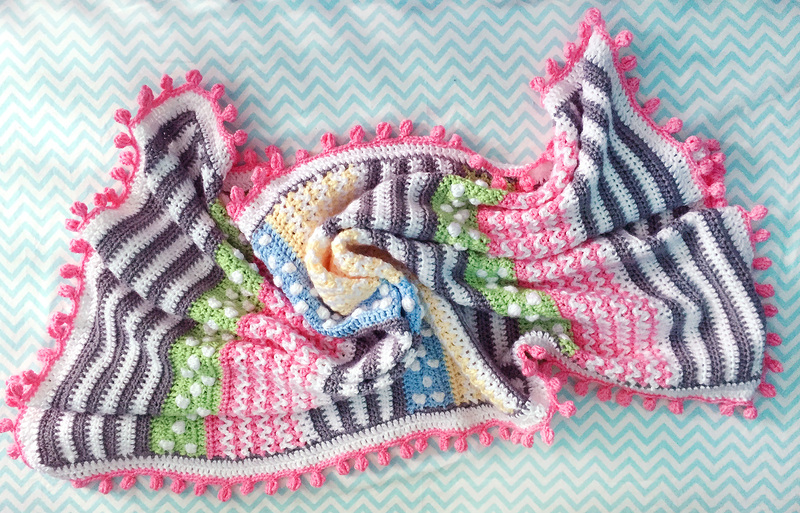 I hope you enjoy this crochet blanket pattern. Please share with me here, or Facebook or on Instagram if you make your own! Want to share the love? Here’s an image ready to pin! This entry was posted in Crochet and tagged Baby, Crochet, Patterns on June 3, 2016 by Stephanie. Surprise! 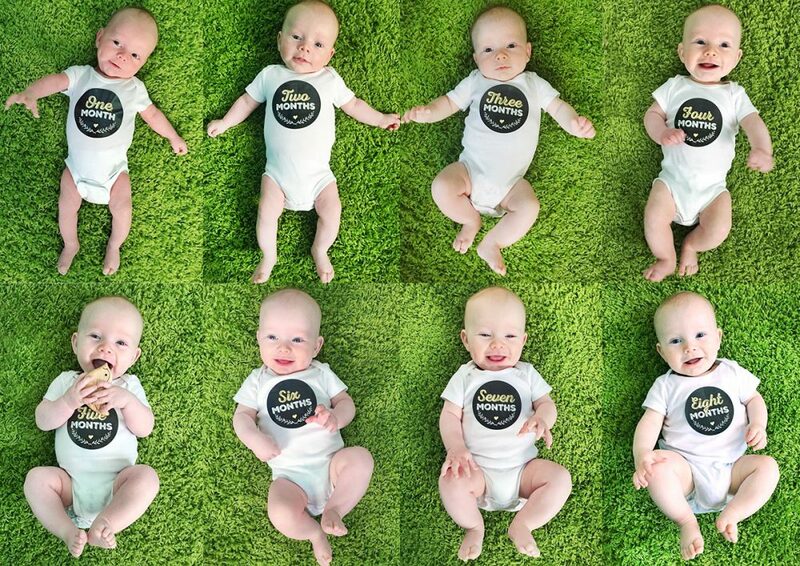 I’ve been busy since September on a very important project… Baby boy number two! If you follow me on Facebook or Instagram, you’re already in the know. 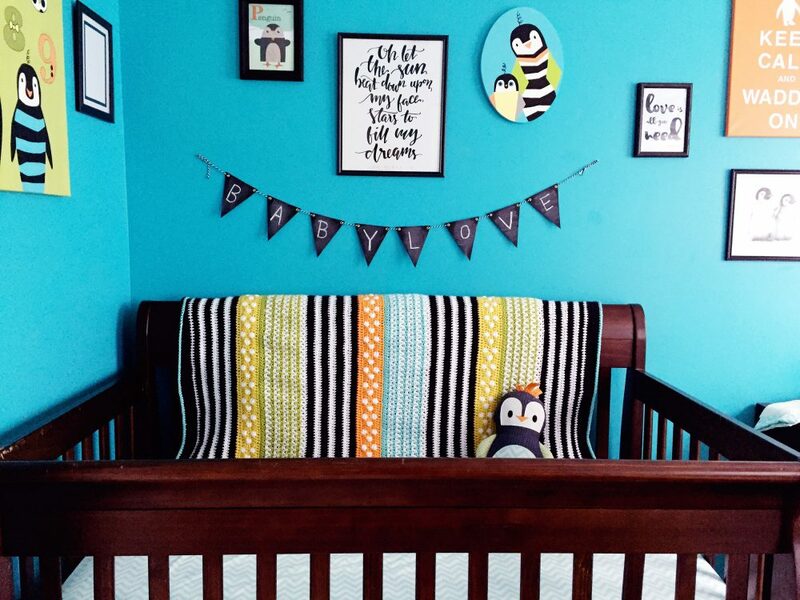 He could arrive any day now and we couldn’t be more excited! We are finally feeling somewhat ready to meet our newest little man. 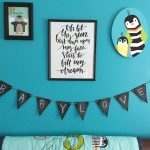 We have a car seat and a pack of diapers, a bit of clothes (mainly from the great thrift stores around here) and our DIY’ed nursery. Allow me to show you around! The nursery is a small bedroom with both its own door and a door into the master bedroom. 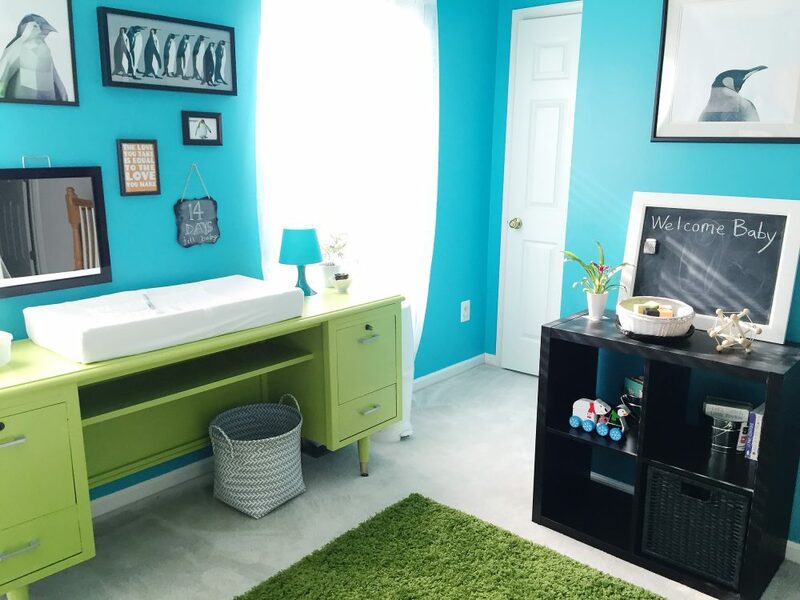 It was once Jax’s nursery, then it evolved to a school room and finally a craft room. 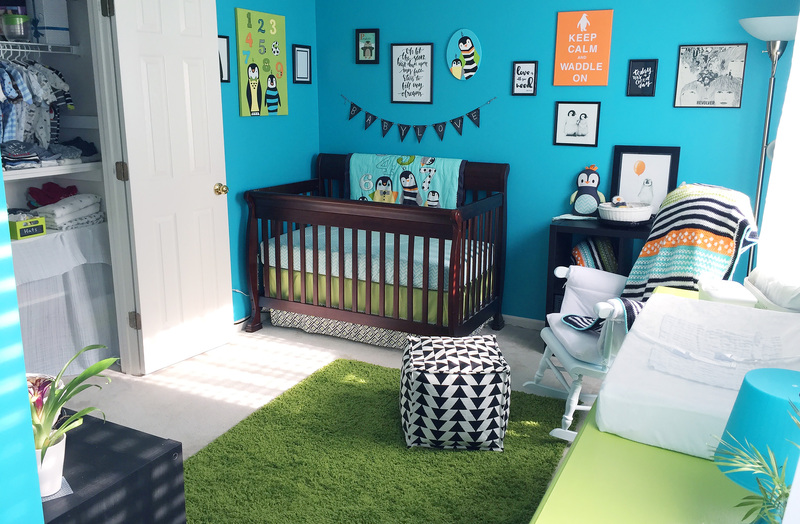 We’re back full circle with a brand new nursery! Furnishings: Jax’s old crib, shelf from Ikea, the rocker my mom nursed me in (painted and cushions sewn), ottoman from Target, rug from Ikea. 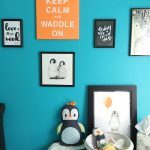 Walls: thrifted alphabet card, Etsy song quote, DIY penguin painting, DIY Beatles quote, DIY ModPodge “Keep Calm” canvas, DIY penguin chick drawing, Etsy song quote, Beatle album cover and Etsy penguin chick with balloon print. 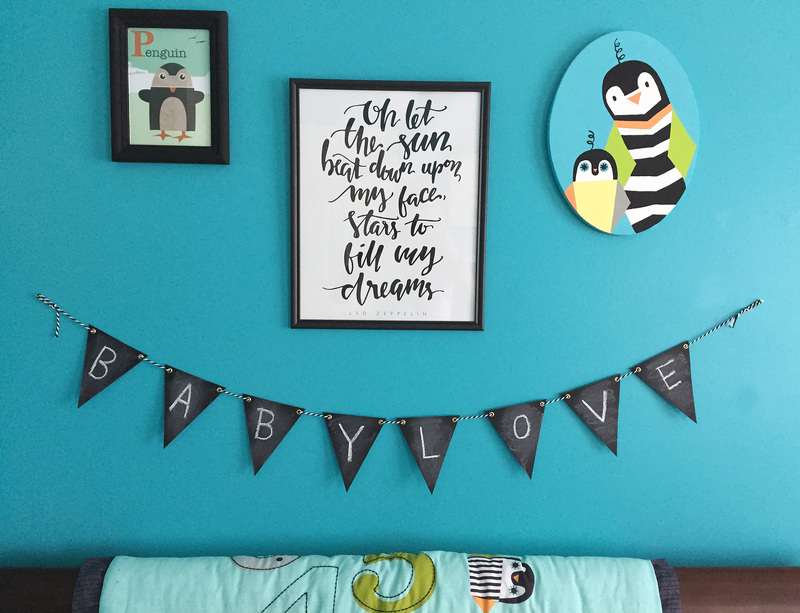 The wall art is a combination of DIY projects, Etsy downloads that I had printed through VistaPrint and thrifted or Dollar Tree frames. 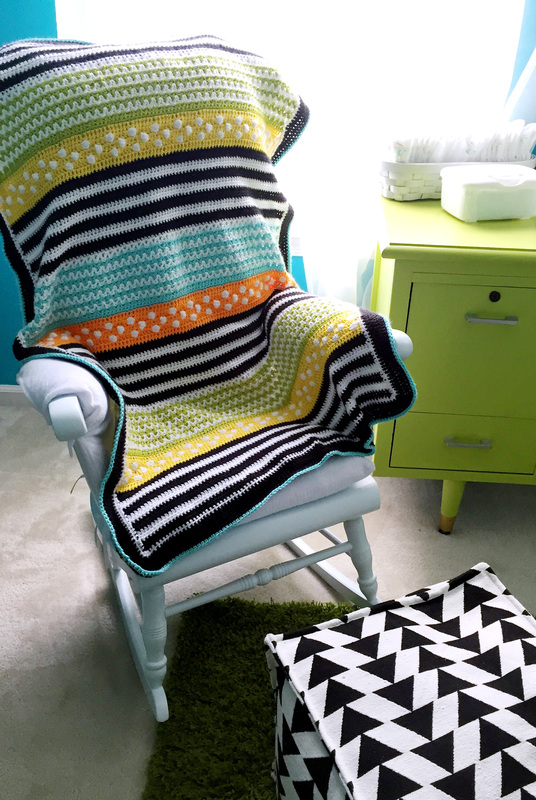 I crocheted a blanket and round cushion with fun, bold patterns to compliment the bedding set. Stay tuned for my instructions on how to make your own! 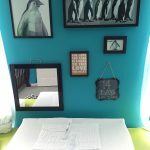 Wall: geo penguin Etsy art, DIY pop art penguins, dollar aisle penguin flashcard, DIY Beatles quote, Target mirror and chalkboard. 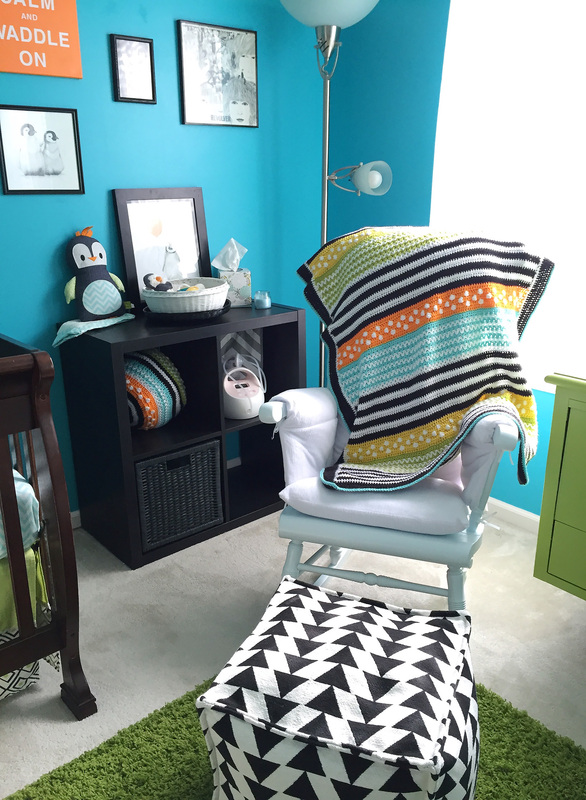 Misc: thrifted/painted diaper basket, hamper from AC Moore, lamp and plant from Ikea, curtains from Ikea. The room already had a large vintage desk that was in the house when we purchased it. 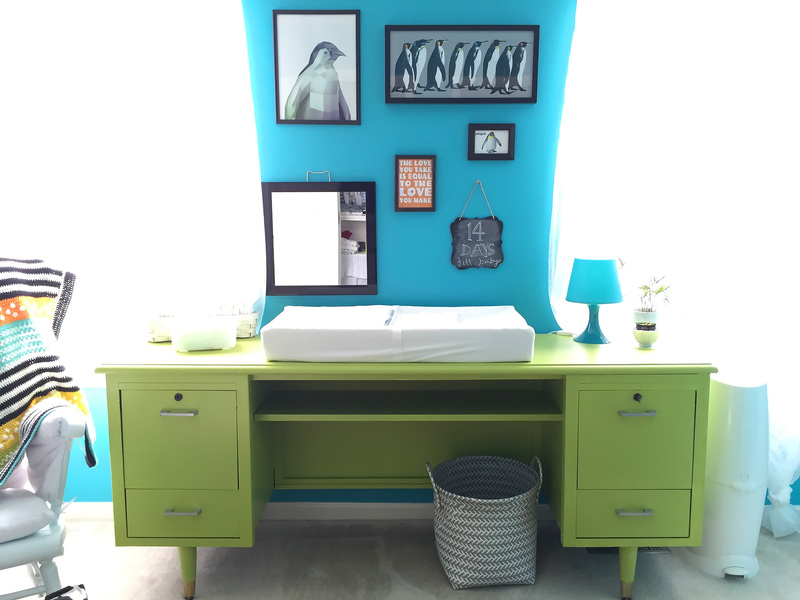 It had been painted white before we inherited it, which was pretty, but I really wanted it to be apple green! After a few sample pots, I went with English Apple by Glidden. The closet was on of my biggest projects. A couple years back, my husband built shelves for craft and homeschool supplies that were very much in use still. After a month of sorting, I got all the school stuff organized in bins and hidden behind an old, ripped muslin swaddle (attached with dollar store stick on Velcro.) I removed one of the shelves so baby’s sleepers could have room to hang. 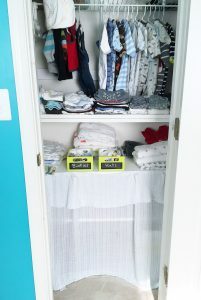 He doesn’t have much clothes yet – a few gifts and what I have thrifted so far – so they are just sorted by size on the shelf for now. 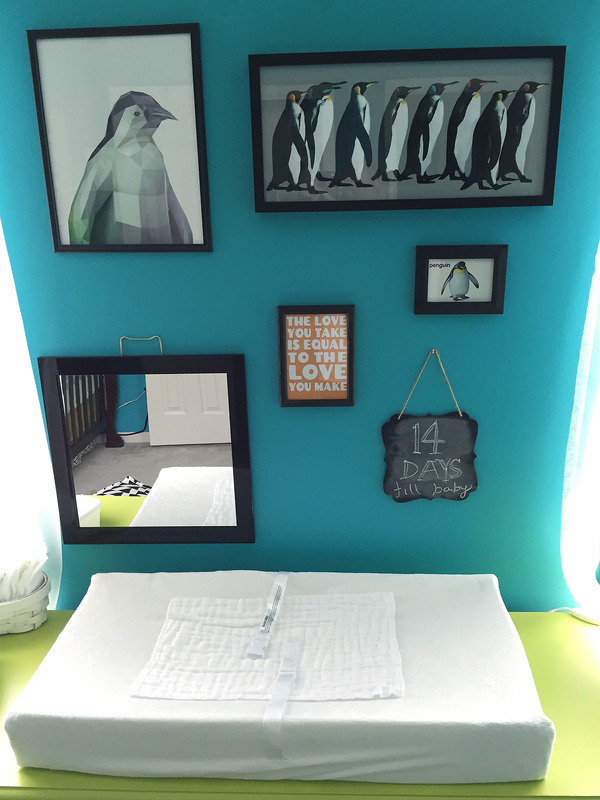 The room feels fresh and soft, while still having the bright, bold colors I love and plenty of black and white. Hanging sheer, white curtains from Ikea helped with that. How perfect is that Target Threshold ottoman?! And it was 25% off after I’d been eyeing it for 6 months. The door to our master bedroom. Upper right photo art: photo printed from Wiki Commons in a thrifted frame. 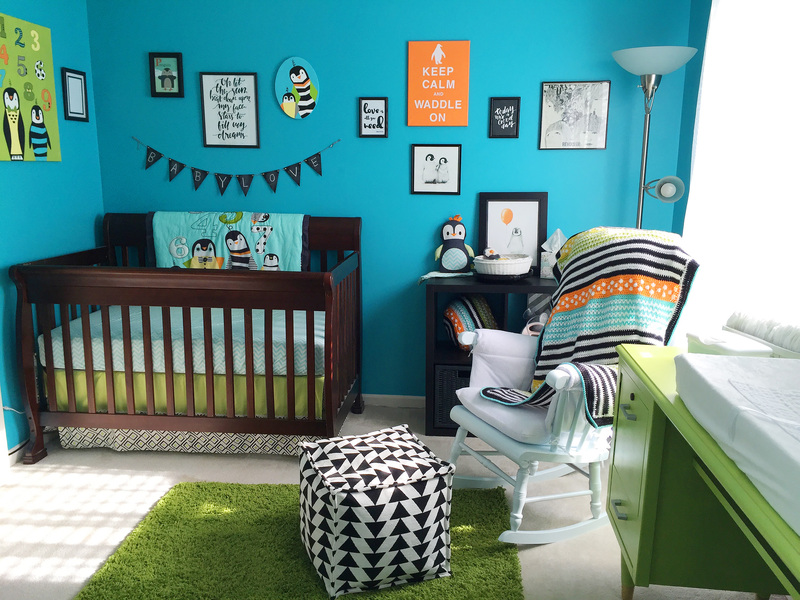 Here are a few more details from around the nursery. 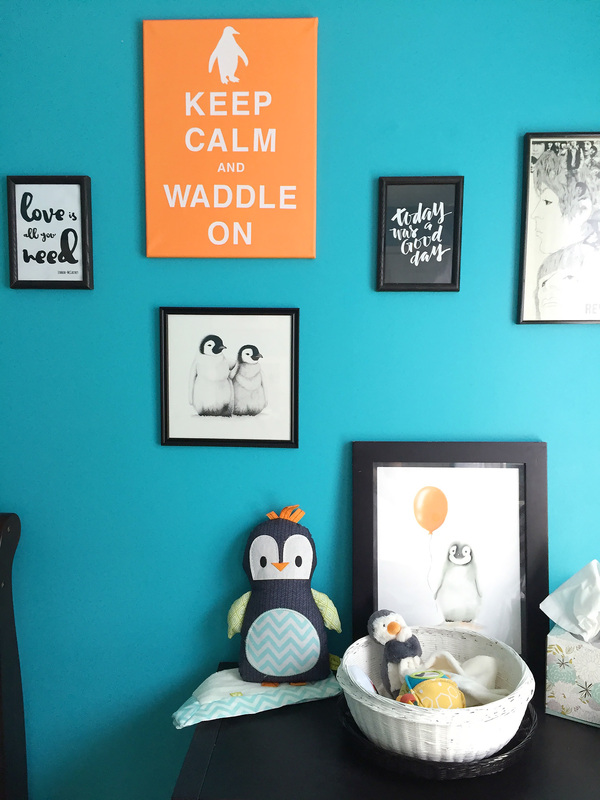 What are your newborn must-haves? It’s been 6 years (and I donated everything!) so I feel like I have a lot of catching up to do!! You can find links to our registries in the sidebar for a little while longer. 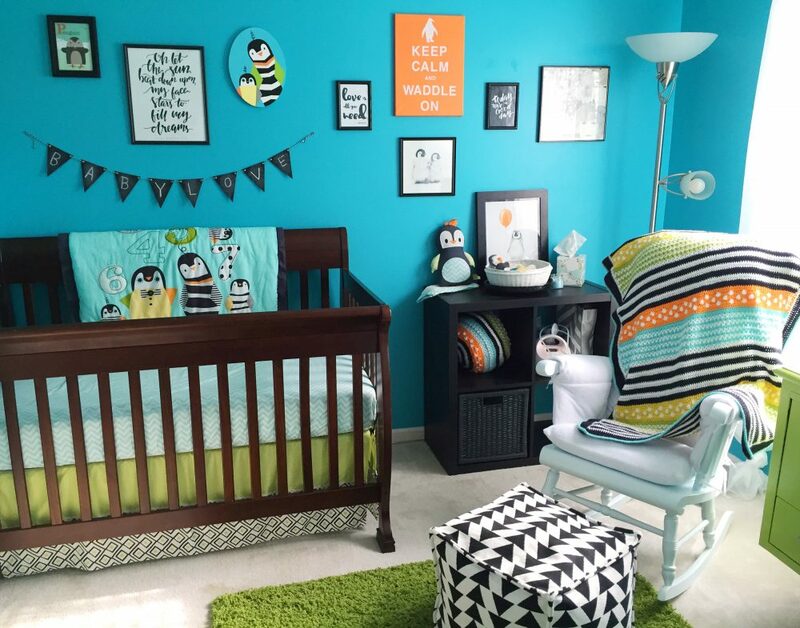 This entry was posted in Love Your Space, Personal and tagged Baby, Decor, Nursery, Penguin on May 26, 2016 by Stephanie. This holiday season, Jax, who is almost 5, asked to make gifts for his grown up friends. 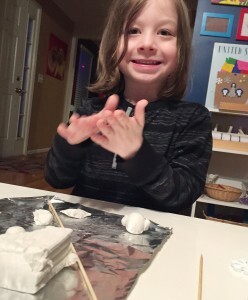 He’s been very interested in play dough lately, so I suggested clay jewelry and trinket bowls. He loved that idea, so we headed to the craft store for some supplies. 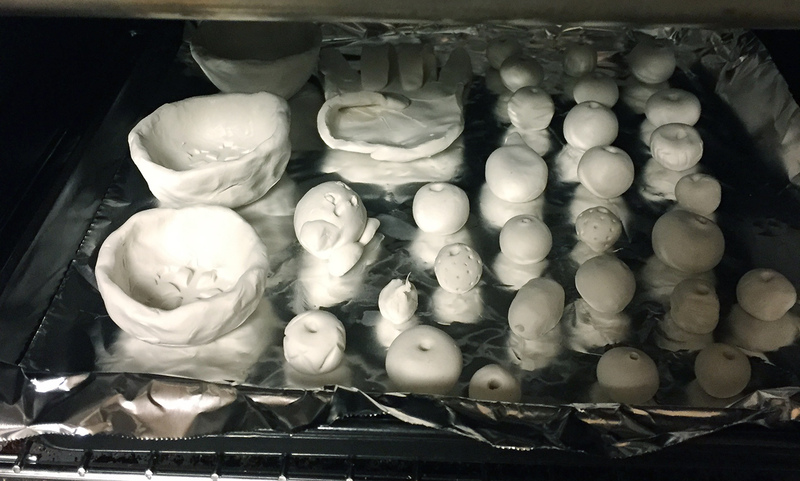 We used Sculpy oven bake clay so that we wouldn’t have to wait too long for it to harden. I got a large white pack with a 50% off coupon. It left him with plenty to play with. 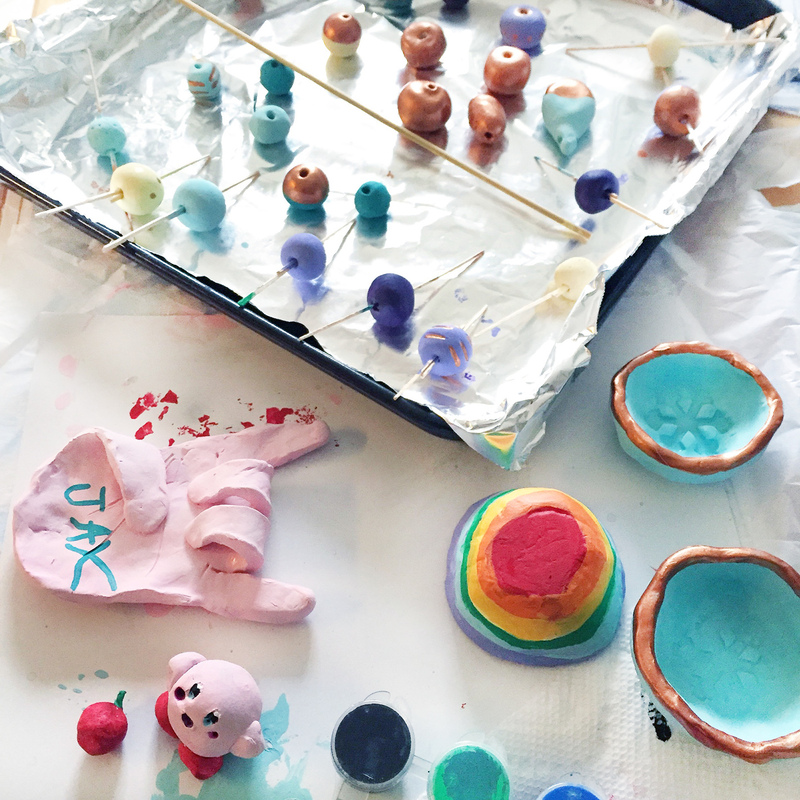 He’s quite fond of making clay Kirbys! 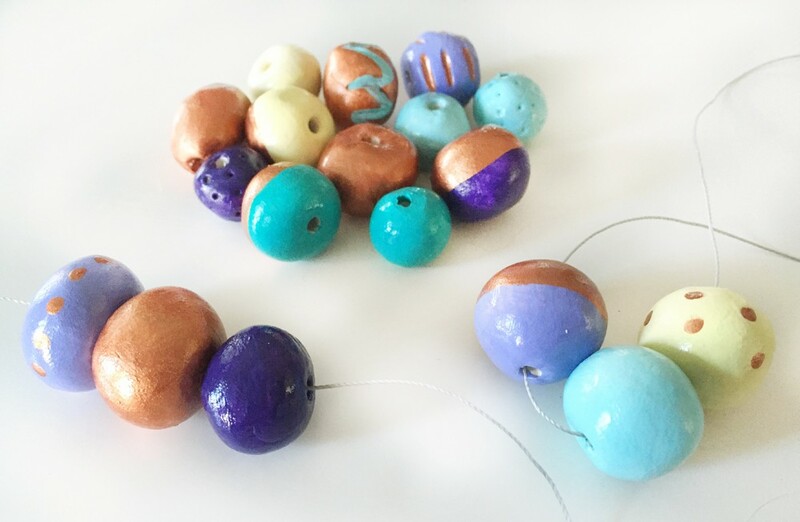 To make the beads, Jax rolled various sizes of spheres and I poked holes in them with a bamboo skewer. 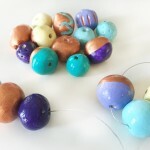 We used the skewers to add texture to some of the beads. We made stripes and dots. The small bowls started as a larger ball of clay that I had Jax dent and squeeze into a bowl shape. Younger kids will need help with this. 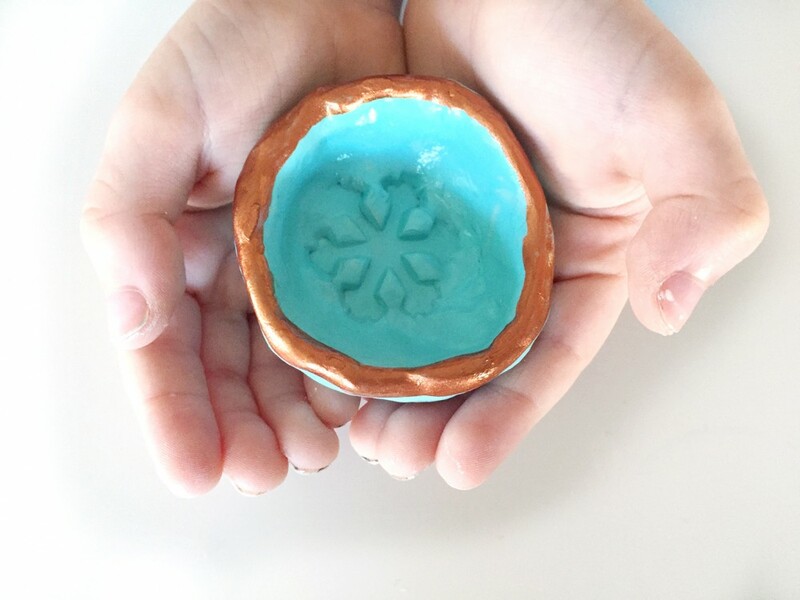 In some of them, Jax used a foam snowflake sticker to stamp an impression in the bottom of the bowl. 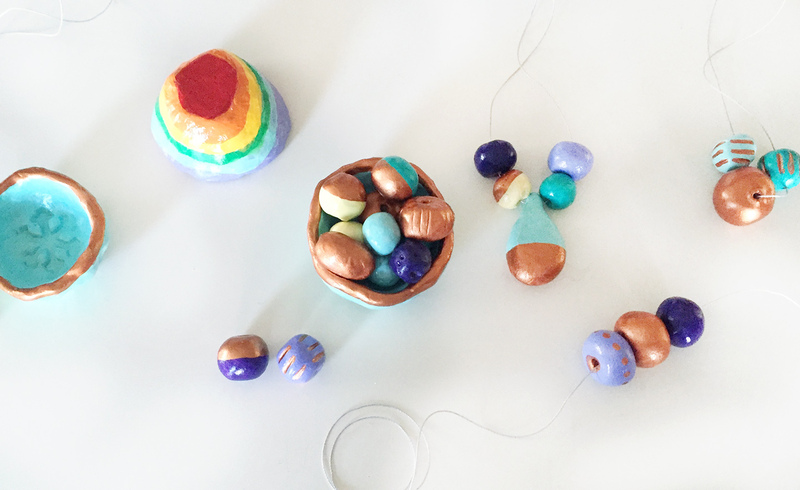 The next day, we spent some of our homeschool time painting all our beautiful beads, bowls and crafts! 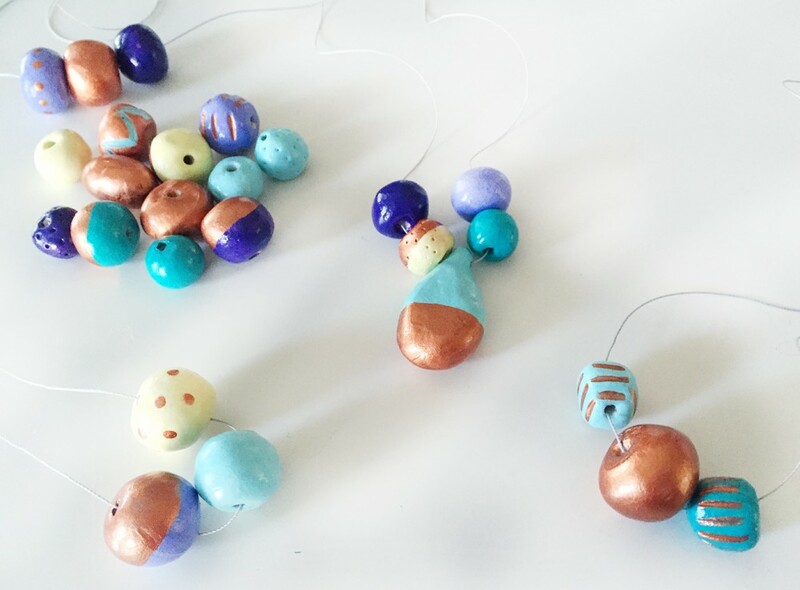 I stuck the beads on skewers and toothpicks to paint them. 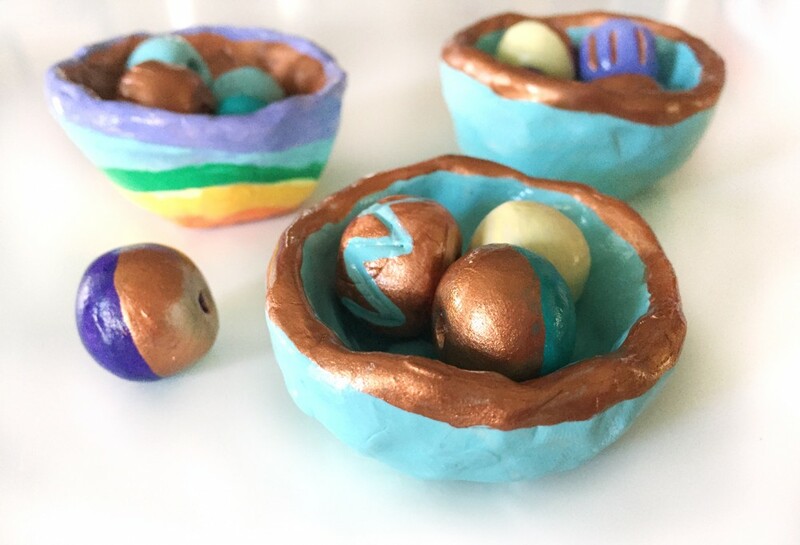 Jax found them to be too tricky, so he told me colors and patterns to use while he painted the bowls. 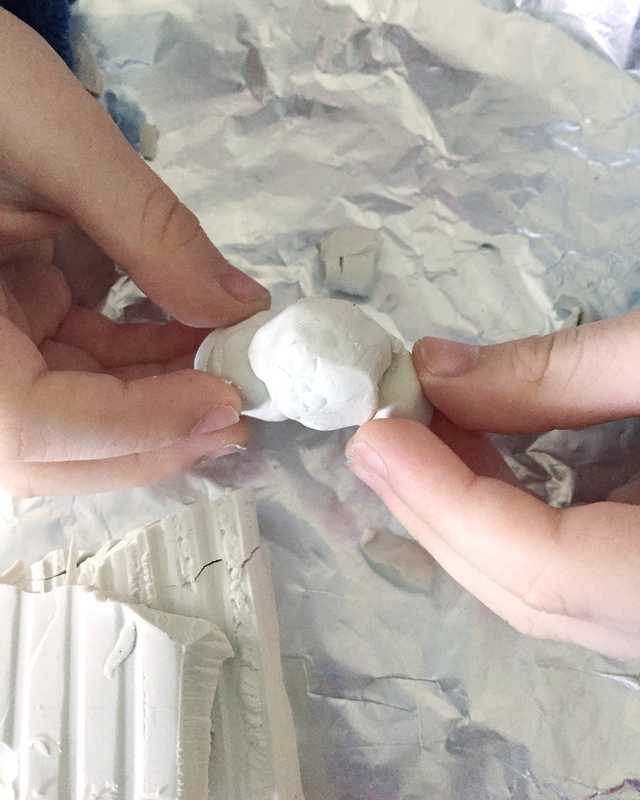 We traced Jax’s hand in clay to make this rockin’ ornament for a guy friend! That evening I coated them with glossy Mod Podge to seal in the paint. Any acrylic sealer would work. To coat all sides of the beads, I strung them on cord and painted them while they hung. 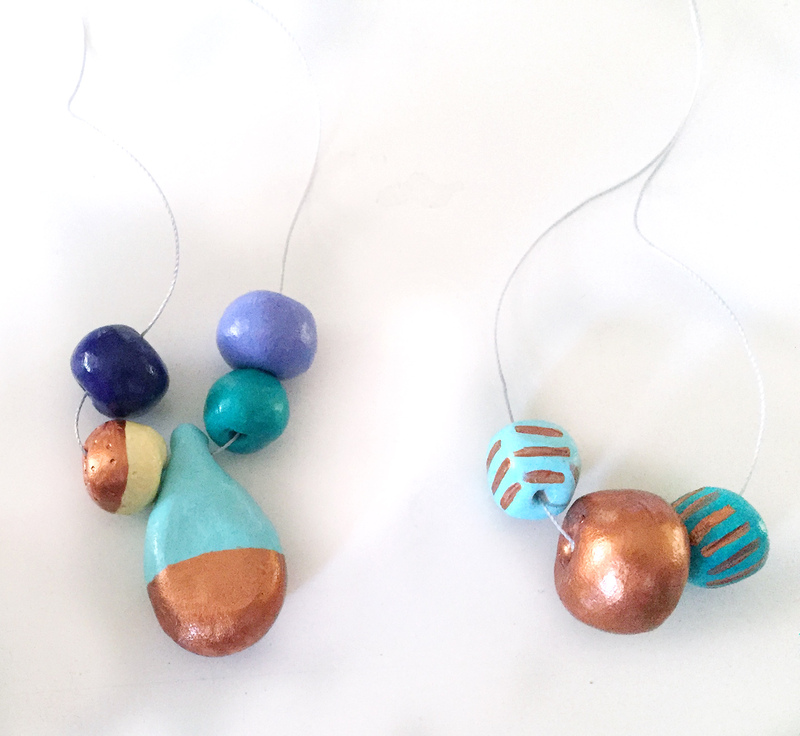 To make our necklaces, I had Jax choose 3-5 beads to string onto a long cord. I tied on copper-toned lobster clasps and tab rings, then sealed the knots with Fray Check. I think he chose beautiful combinations! We really enjoyed working on this craft together. I think a child just a couple years older would be able to do it all (besides the oven) themselves. Jax has been so proud to hand out his gifts! He’s been telling everyone that they were made with love. 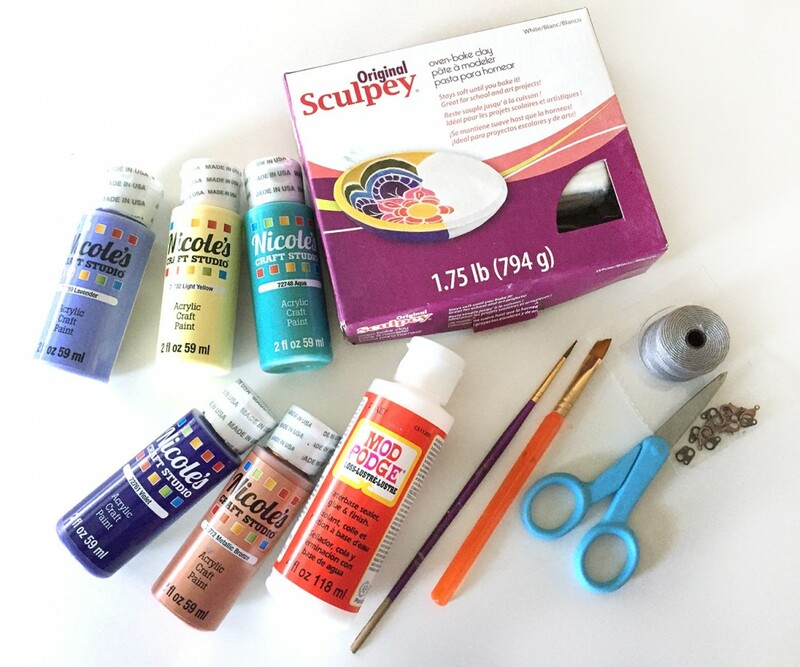 This entry was posted in Crafts and tagged Clay, Crafts, Jewelry on January 7, 2016 by Stephanie. 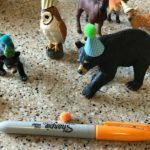 I have a fun surprise for you all… A giveaway! Marie-Claire is a momma of twin boys, a graphic designer, the owner of SO Awesome, and the creator of Children’s Wallet Cards. You’ll remember her from our post and giveaway last September. 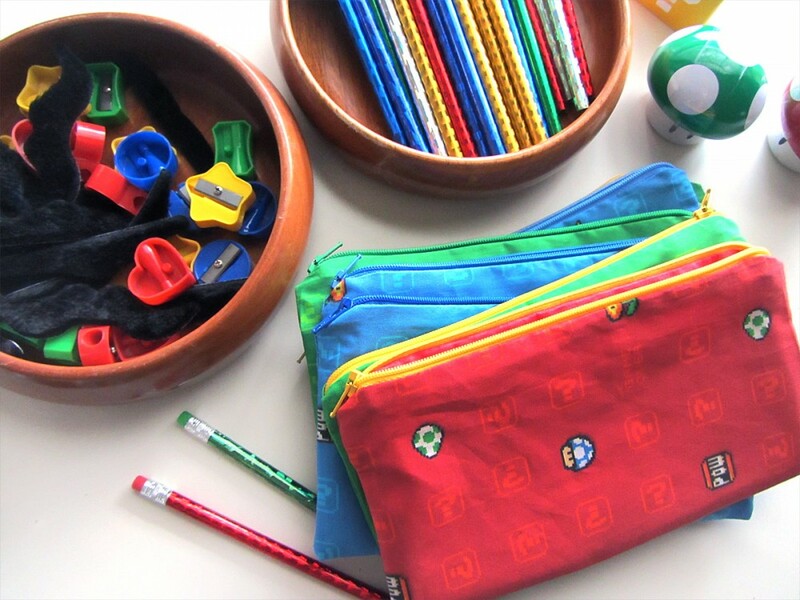 Her wallet cards have so many uses and fit well into your Montessori and homeschool supplies. 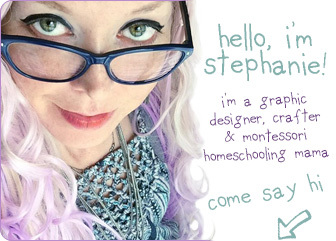 She’s at it again seeking micro-funding from moms and homeschoolers like you on Kickstarter. She has four new sets in development, Emotions, Seasons, House and Pets. Funding pledges start at just $1. Kickstarter is all-or-nothing funding for creative products, supporting new projects is quick and easy. The campaign is open until April 29, 11 am EST. 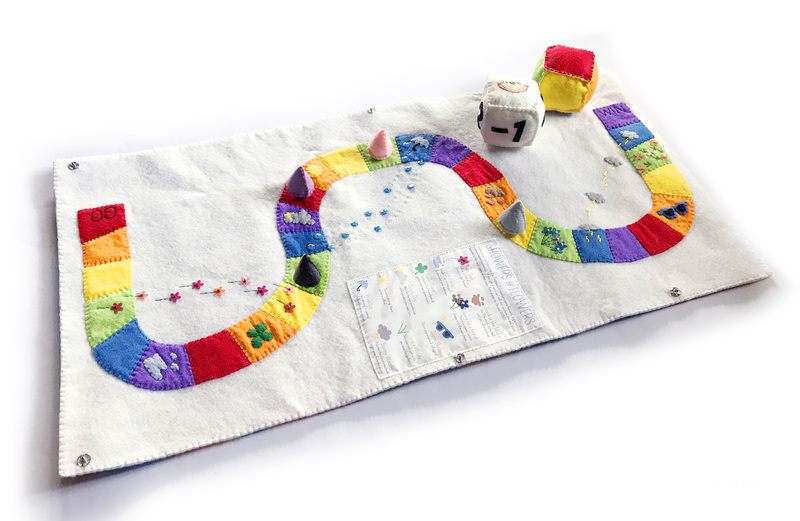 So Awesome’s alphabet deck from their previous Kickstarter campaign. SO Awesome has generously offered a $100 store credit to the winner of this random giveaway. To enter, visit SO Awesome’s Kickstarter page, then leave a comment here letting us know what your favorite new deck is. Then use the Rafflecopter widget below to let us know you’ve commented (email address or Facebook required). There are bonus entries available to anyone who enters. The lucky winner will be randomly chosen on April 29, 2015. 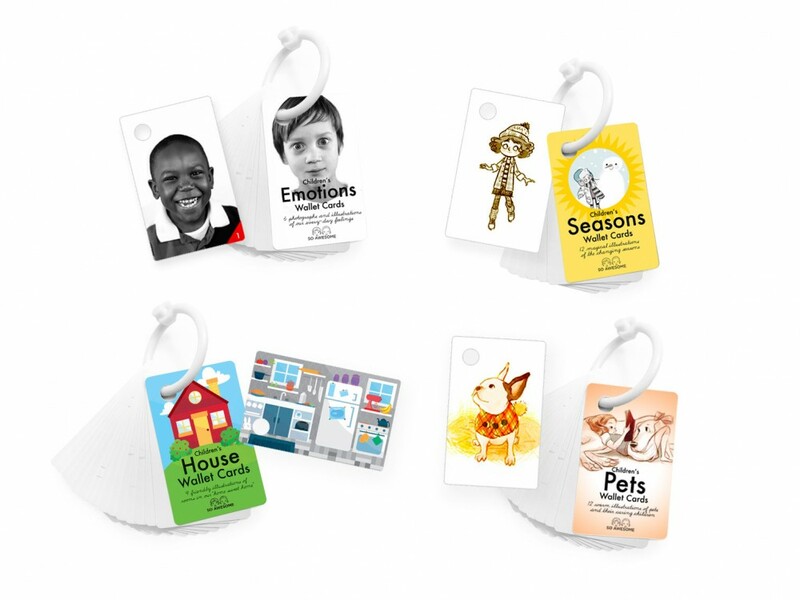 SO Awesome offers gorgeous, educational, non-toxic, extremely durable card sets designed for how kids play and work. 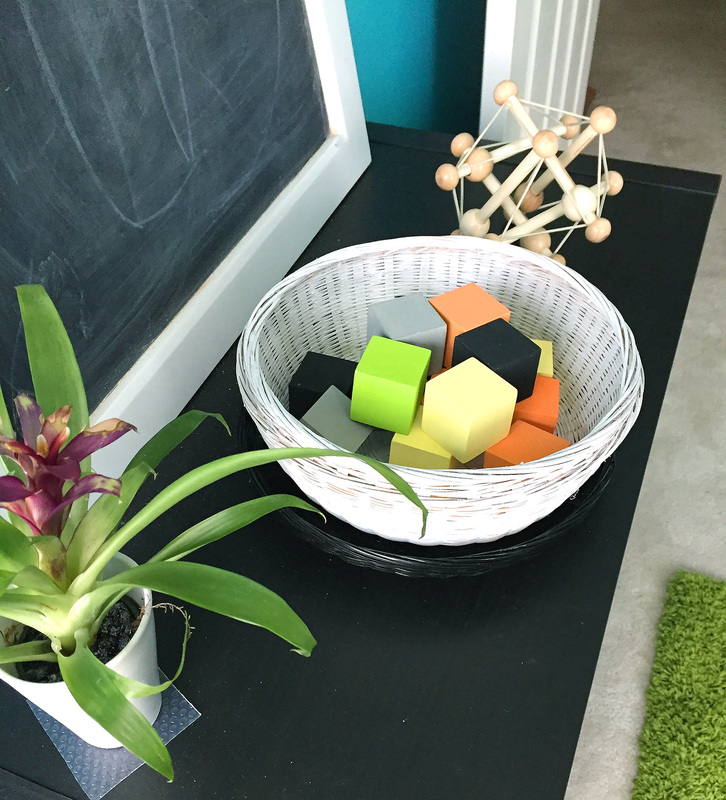 Montessori-inspired. Made in the USA. 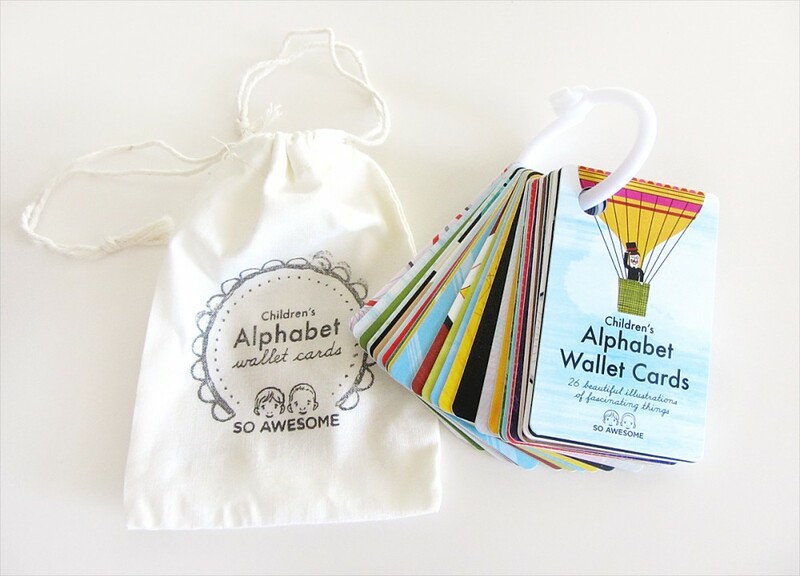 Their cards are perfect to engage children in carseats, strollers, shopping carts, and long airplane rides. 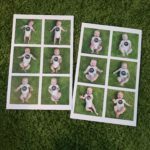 Graphic Designer and mother Marie-Claire Camp created the durable, non-toxic card sets for her twin boys. Using the crowdsource-funding site Kickstarter, Marie-Claire produced five sets of cards and an companion iOS app. This entry was posted in Giveaways, Homeschool, Montessori and tagged Giveaway, Homeschool, Montessori on April 19, 2015 by Stephanie. My little man is turning 5! He’s very into his Wii and anything Super Mario, so it was easy to pick his party theme. 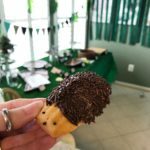 I always like to include a handmade party favor for our guests. 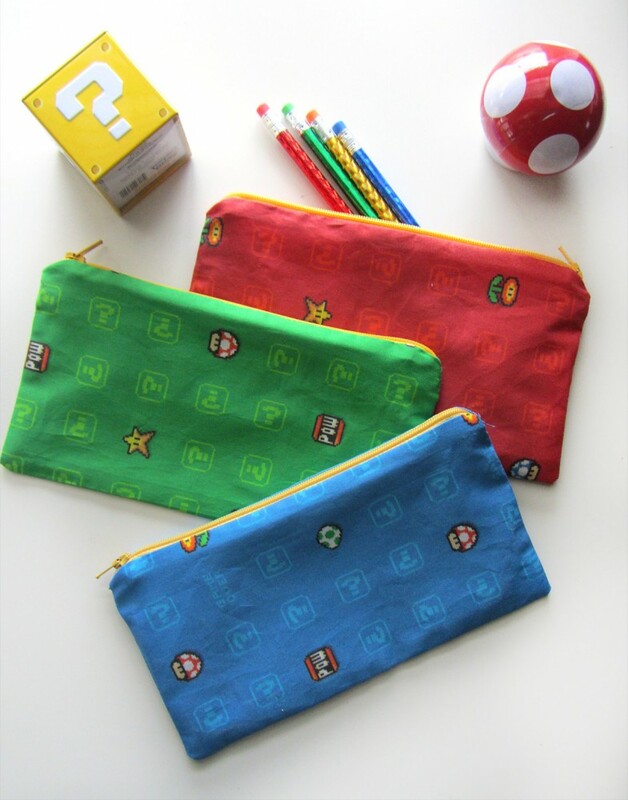 This year, I’m making pencil bags! Since I am making 12 of them and my free time has been so limited lately, I had to make them quickly. 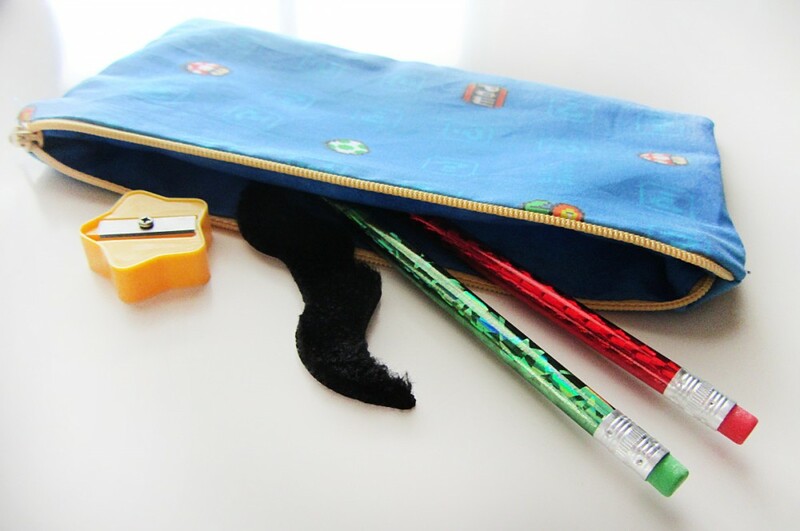 And so, the Nine Minute Pencil Bag was born! I used fabric that I custom designed and ordered through Spoonflower. (If you like my fabrics, you are welcome to order them too! I think I get about $1/yard to spend there if you do.) I made a question box tumble is three colorways: red, green and blue. I ordered one fat quarter of each. I needed a dozen 9″ zippers, so I ended up buying this zipper assortment . It came with a good assortment and only one of them was the wrong size out of 54. I also bought three additional fat quarters in coordinating colors. 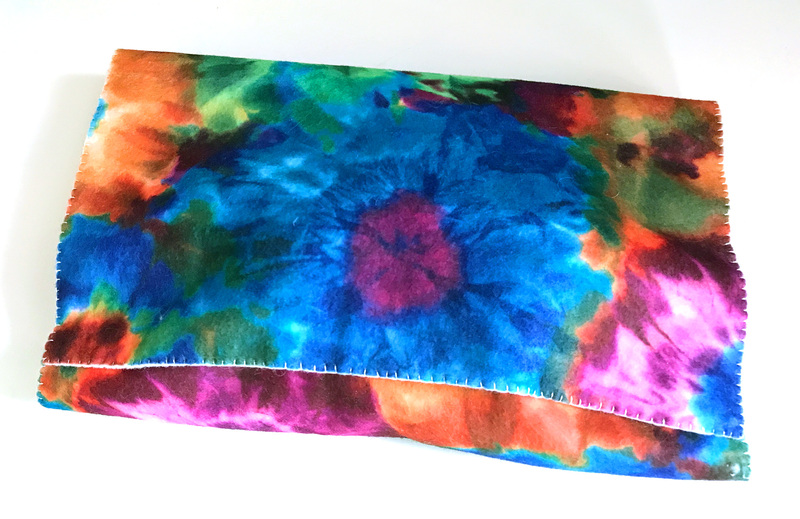 With 6 fat quarters (3 outer fabric and 3 lining) you can make 12 bags. I don’t talk in this video – turn on CC if you’d like written instructions. And enjoy one of my favorite classical pieces – The Blue Danube! 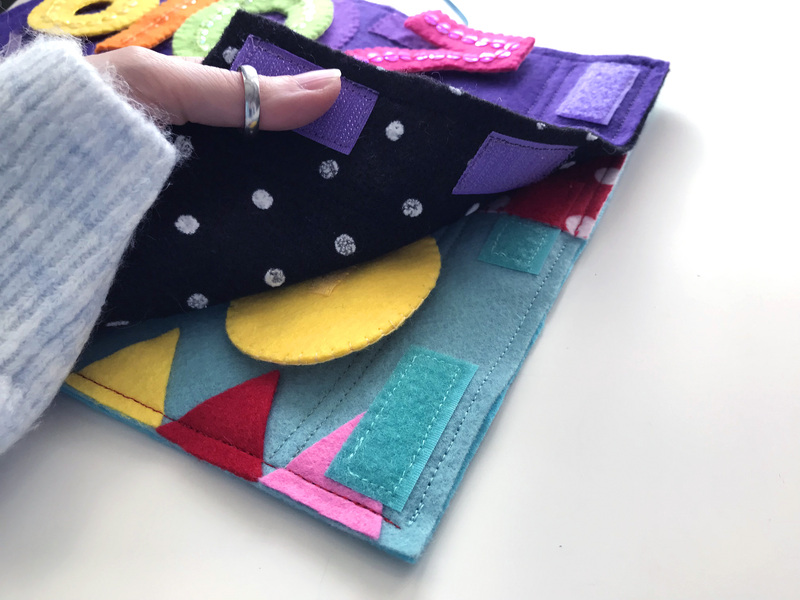 You start with a “zipper sandwich” – take one rectangle of each of the fabrics and lay then stacked, right sides facing. 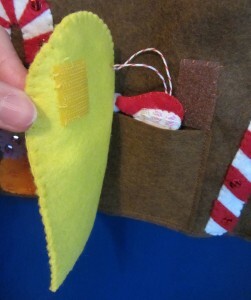 Place the zipper inside the sandwich facing the outer fabric. Line its edge up with the long side of the fabric on the inside of the sandwich. 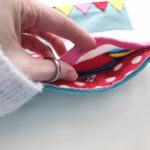 Sew along the zipper with a zipper foot (moving the zipper pull partway). Flip the two rectangle so their wrong sides are facing and the zipper is sticking out of the sandwich. Make a new sandwich around it, right sides facing in, putting the lining on the lining side and outer fabric on the outer fabric side. 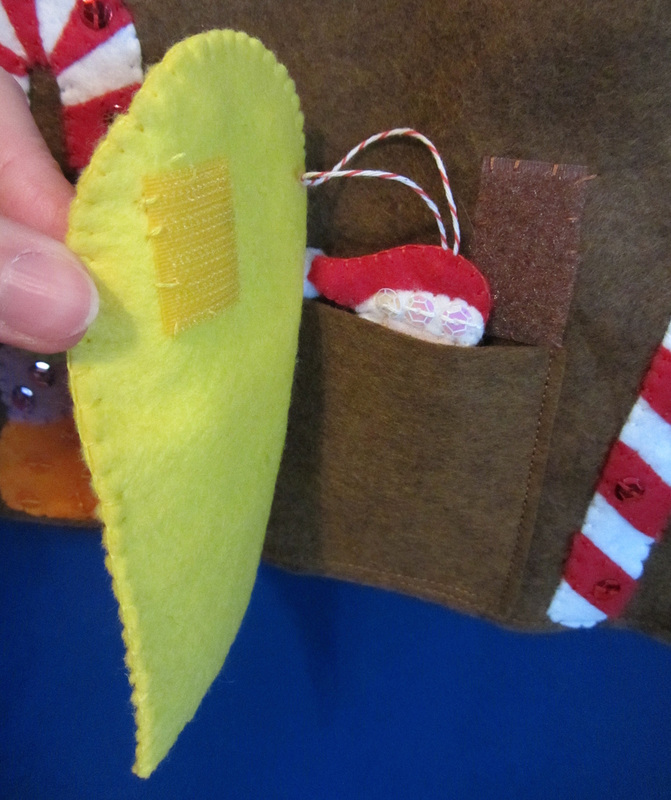 Sew the edge with a zipper foot (moving the zipper pull partway). Open up the rectangles so right sides are out and the zipper is in the center. Iron it smooth, then flip the sides so the linings are together (right sides facing) and the outer fabric pieces are together (right sides facing). Press the zipper/seam towards the lining. Open the zip halfway. Starting on the short side of the lining near the bottom of the zip, carefully sew across the zipper. (Make sure you do not sew over the metal crimp at the base of the zipper. It will break your needle!) Sew all the way around until you get back to your starting side, then stop when you have 3″ left to go. Leave that open for turning. Clip the tails at both ends of your zipper, then clip all four corners. Flip the bag right side out through the hole, unzipping the zipper the rest of the way when you are able. Make sure you poke all the corners out. With the outer fabric and lining on each side, iron it smooth. Fold in the hems of the lining opening and iron it to crease it. Stitch it closed close to the edge. Push the lining into the bag and iron it inside and out, making sure to iron the fabric away from the zipper. All done! I’ll be filling ours with Dollar Tree pencils, sharpeners and faux mustaches. They turned out super fun! 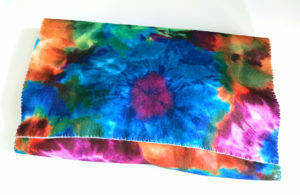 If you make some Nine Minute Pencil Bags, I’d love to see them! Share them on my Facebook page or mention me on Twitter or Instagram ( @iolstephanie ). Enjoy! 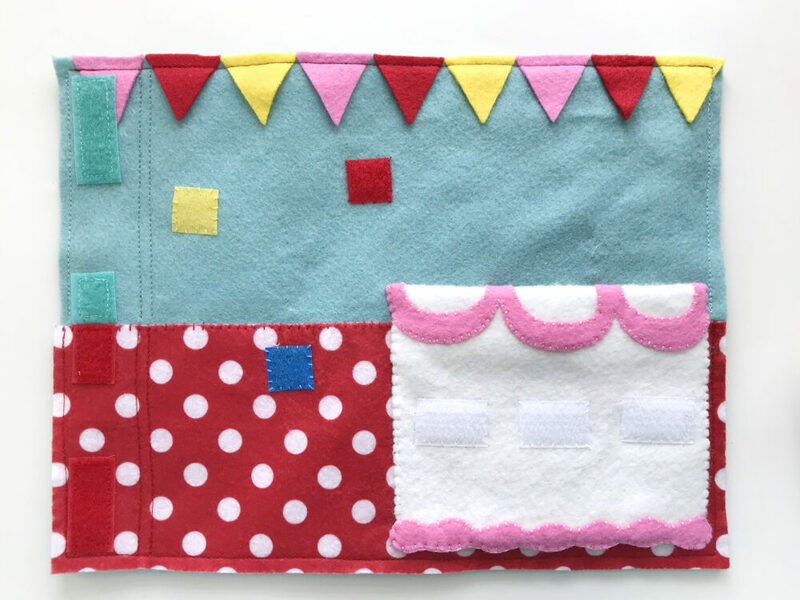 This entry was posted in Party Ideas, Sewing, Sewing Projects and tagged Crafts, Parties, Sewing, Sewing Projects, Tutorial, Video on February 4, 2015 by Stephanie. 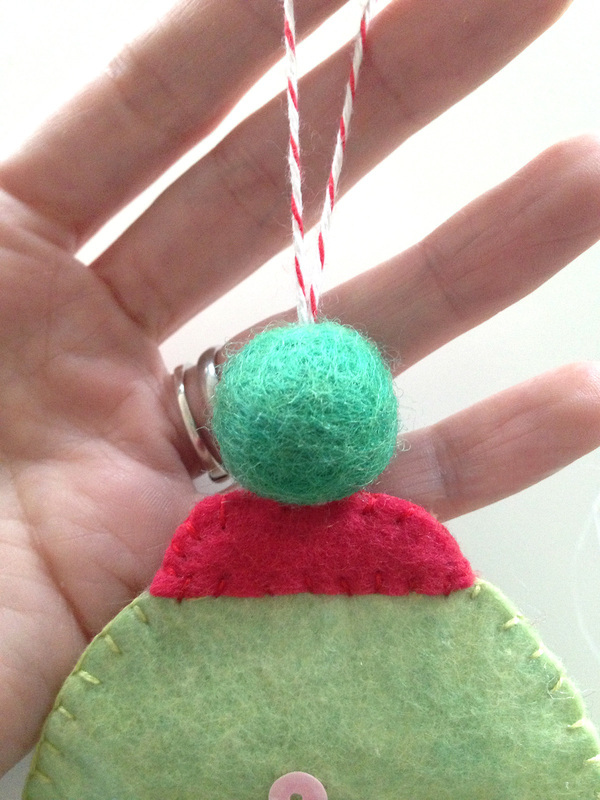 I love sewing felt ornaments every year to hang on our tree. This year I picked the theme of sweets! 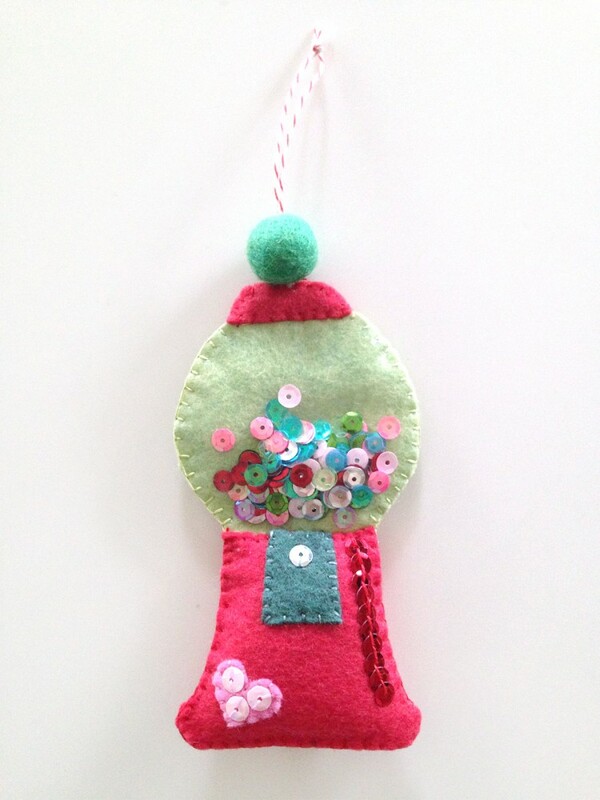 This simple but colorful gumball machine sews up in just one evening but will make a big impact! 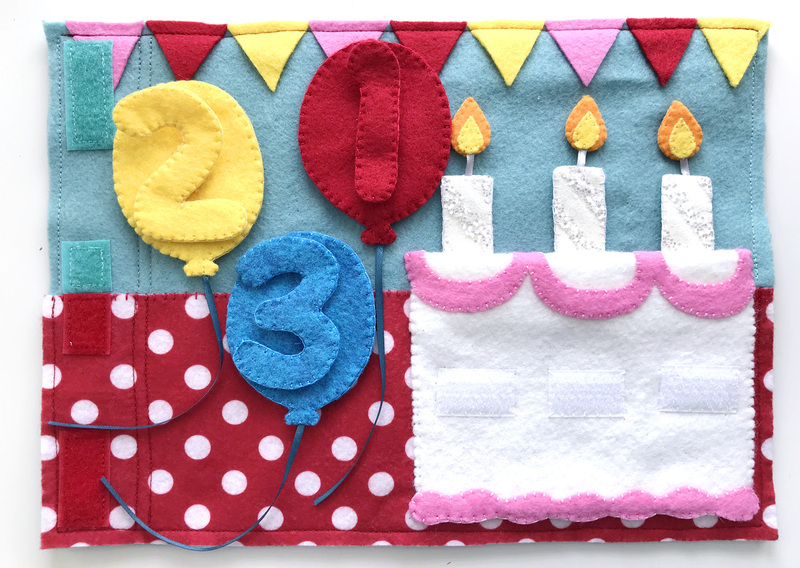 I used wool-blend felt and colorful sequins from American Felt and Craft. I chose a color palette that was slightly retro with honeydew, poppy, pink and teal. Step 1: Layer the honeydew felt dome between the two vinyl dome pieces and sew from A to B with a blanket stitch. Fill each side of the dome with sequins as desired. Sew the top closed. Step 2: Sew the curved top to the two poppy cap pieces together with a blanket stitch, then place it over the top of the dome and sew across the cap’s bottom. 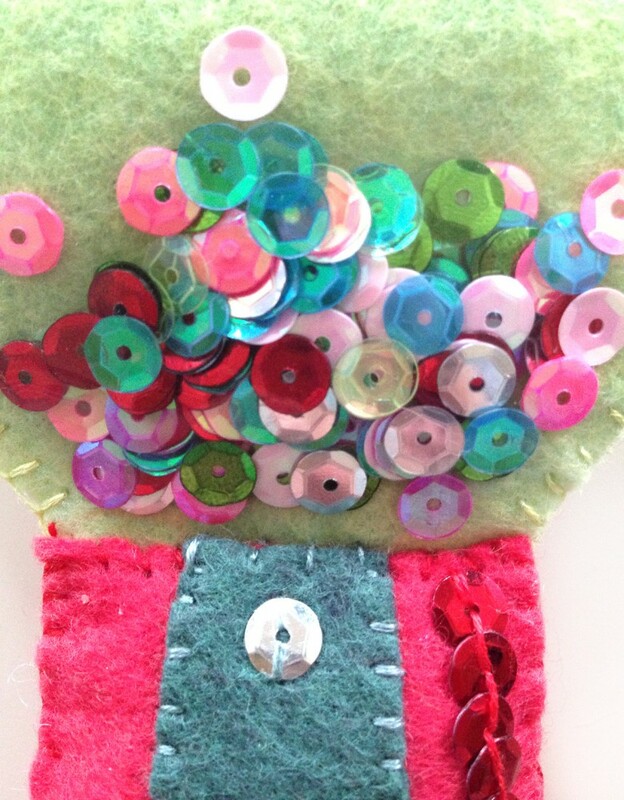 Step 3: Sew a row of red sequins down the side of each poppy machine piece. 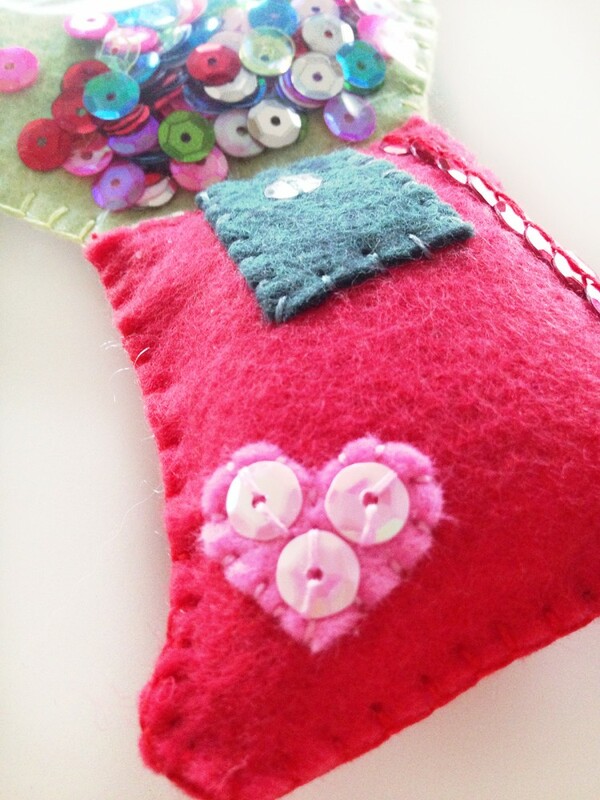 Sew a pink heart to each side and add sequins. Sew the hatch to the front machine piece and add a silver sequin. 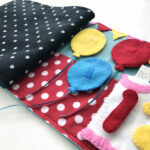 Step 4: Sew the machine together from C to D with a blanket stitch and fill with stuffing. Stick the dome inside the open end and sew the machine pieces closed. Step 5: Thread a large needle with baker’s twine. 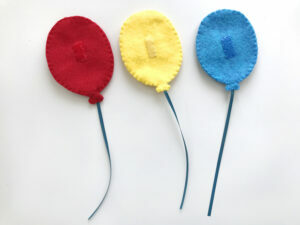 Attach the center of the twine to the top of the cap then run the tails through a felt ball or pom. Tie off and enjoy! 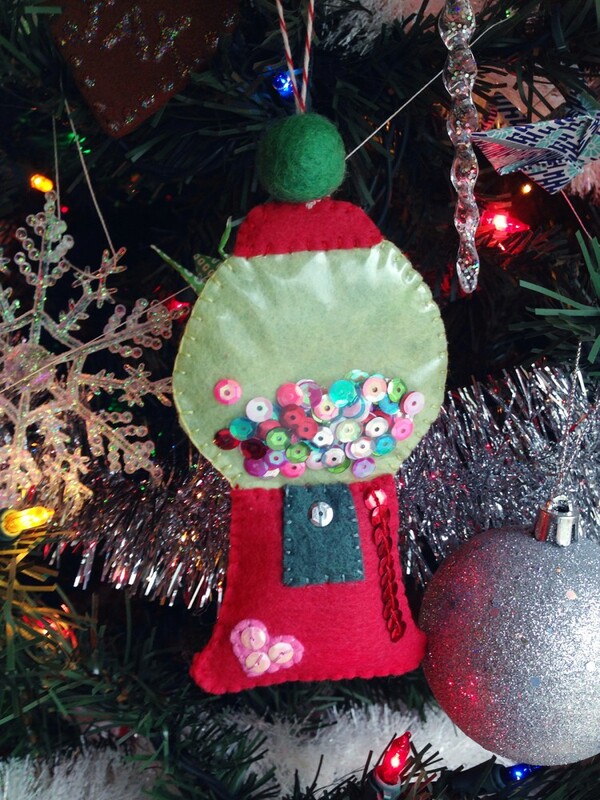 This entry was posted in Crafts, Sewing, Sewing Projects and tagged Christmas, Free, Patterns, Sewing, Sewing Projects on December 19, 2014 by Stephanie. 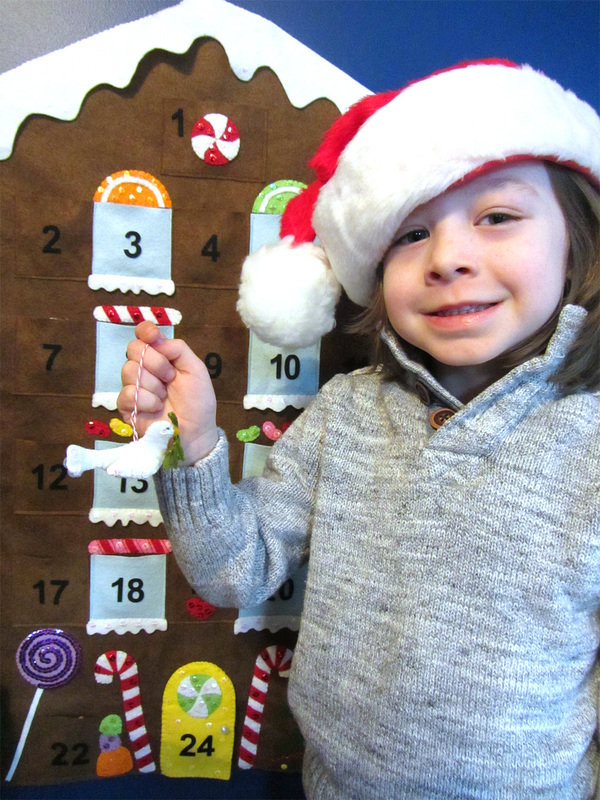 Last year I had so much fun sewing Jax a Christmas Tree Play Set and 24 Mini Advent Ornaments, but I didn’t have time to make a calendar to put them in. 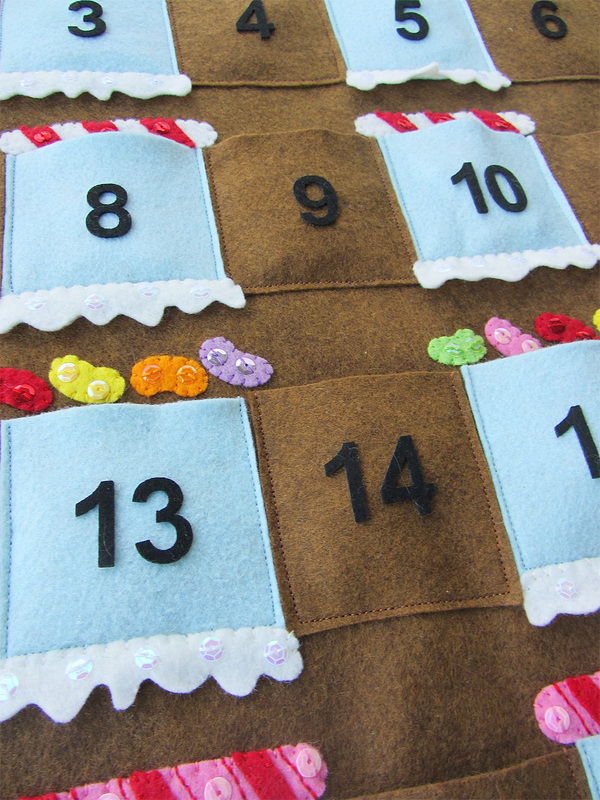 This year I started off my Christmas sewing season by creating a hanging gingerbread house advent calendar. 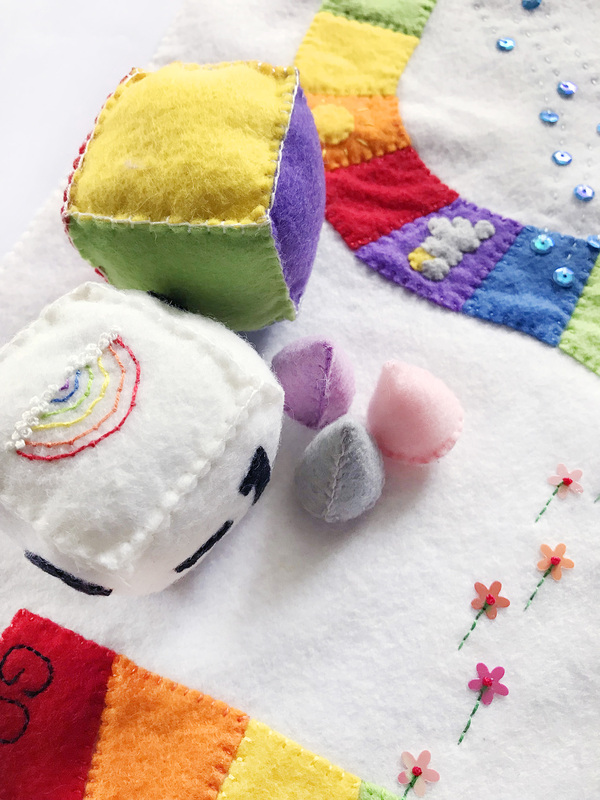 Thank you to American Felt and Craft for all of the beautiful supplies used in this project! 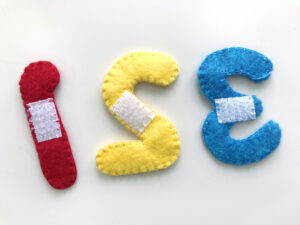 I started sewing this project before I had the brown background felt, so I began with all the smaller pieces. I will list the tutorial sections in an order that makes sense, but there is definitely some flexibility. 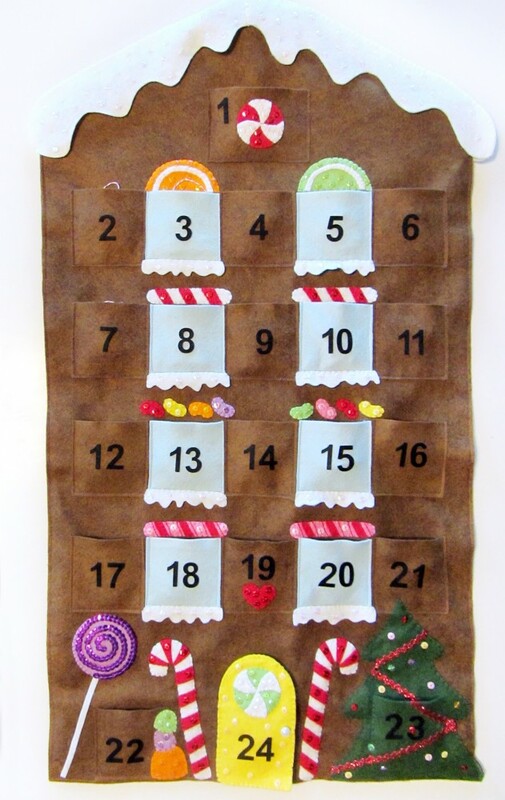 I created the advent calendar with the ability to come off the hanger. The roof is a separate piece that sits on top of the hanger like a hat with a hole for the hook. I cut my roof pieces out of 9: x 12″ sheets, so each side is made of two halves sewn together. On the front half, I decorated it with crystal sequins. When sewing the two sides together, I only sewed the tops, leaving a 2″ hole at the center-top for the hanger hook. Attach your numbers to the pocket squares. I used adhesive numbers, which saved so much cutting time. If you are cutting them yourself, gluing them on with felt glue will work just fine. On pocket 1 (a rectangle), layer white swirls on top of a red circle to make a peppermint swirl candy. Sew it to the pocket and add red sequins. On pocket 19, sew on the red heart and add some red sequins. 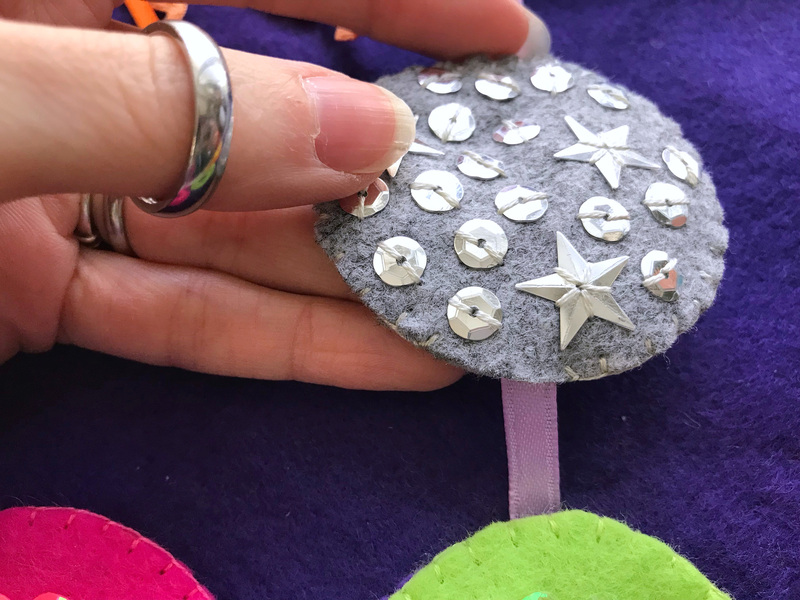 Cut out 8 snowy window sill pieces and sew sequins on them. 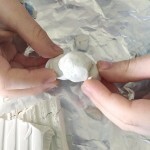 Using felt glue, tack them on to the bottom of the blue pockets. I glued mine on before sewing on the pockets, but you can do it either way. Sew down the tops of the snow pieces, leaving the bottoms hanging loose. 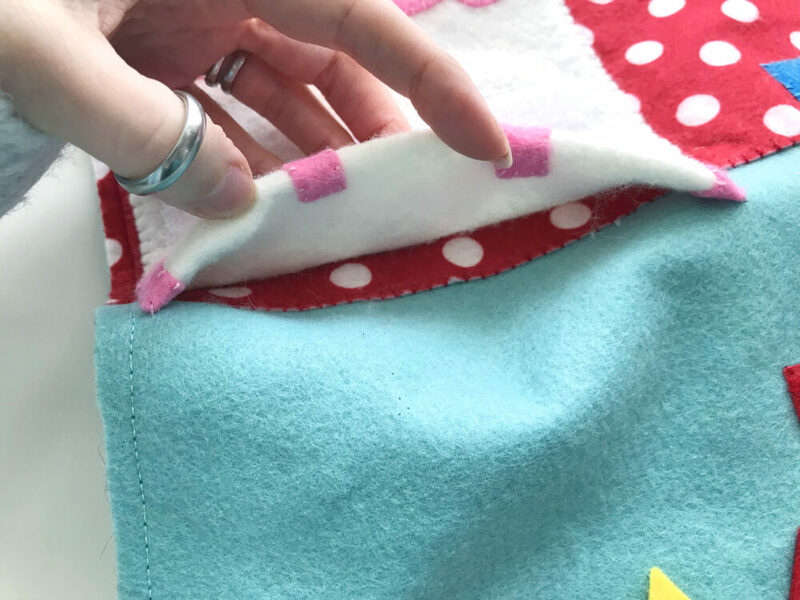 For each fruit slice, tack down the white rind with a light layer of glue (too much and it is hard to sew though) then sew it down. 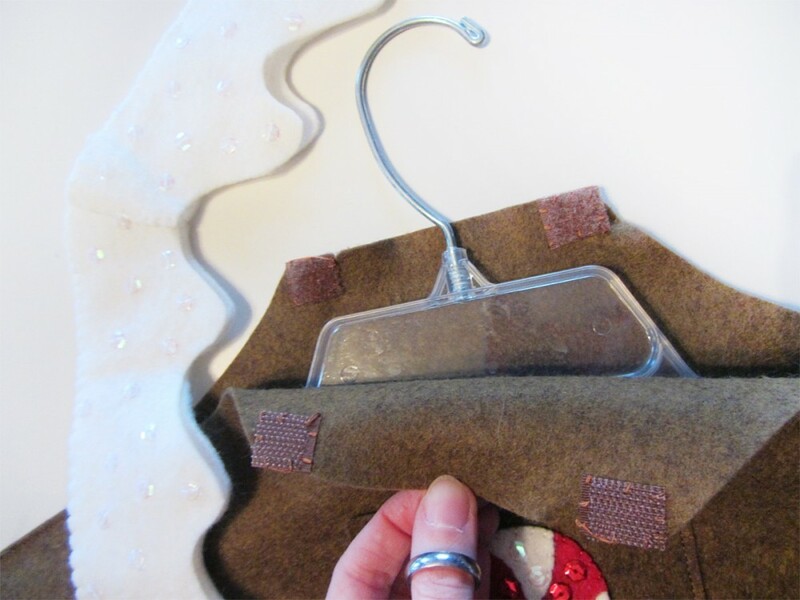 Add matching sequins to the colored parts, then sew them down directly over pockets 3 and 5. 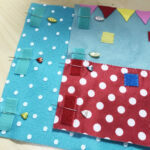 For the red and white candy sticks, tack down then sew on the red stripes, added red sequins. Sew them down above pockets 8 and 10. For the pink and red candy sticks, tack down and sew on the thinner red stripes. 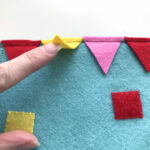 Using a back stitch, sew a stripe on each side of the red felt stripes. Add a few pink sequins, then sew them down above pockets 18 and 20. 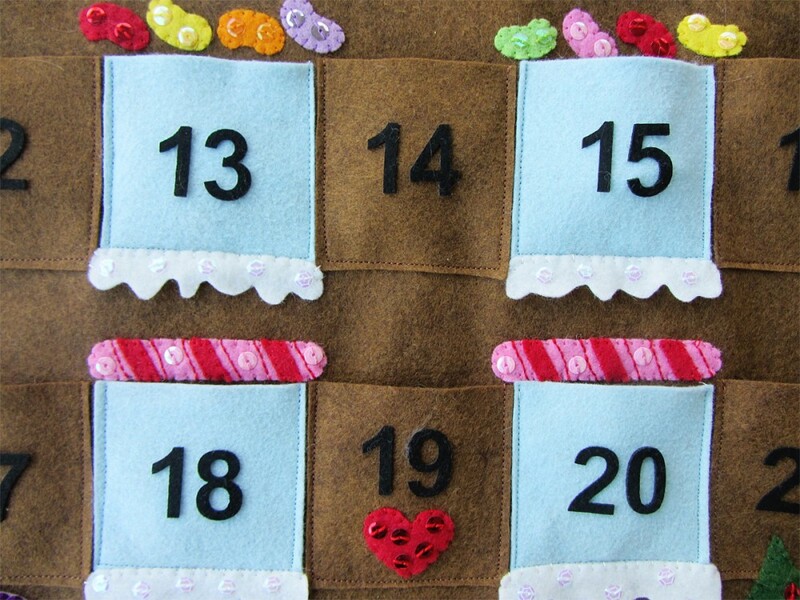 I tacked down the jelly beans directly onto the calendar. White sewing them down, I alternated their direction and added matching sequins. Four jelly beans go over pocket 13 and pocket 15. 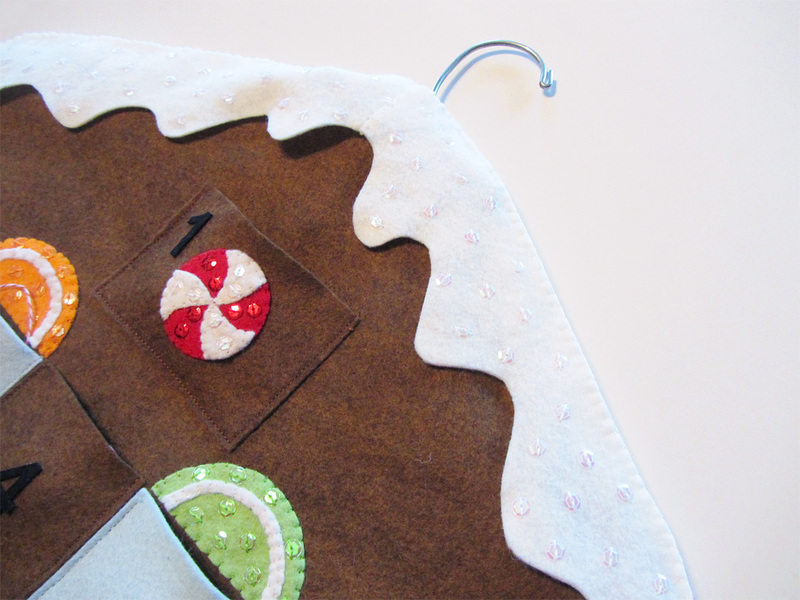 On the front piece of the door, sew on a green peppermint swirl candy (using the same technique as the red). The number 24 goes below that with room for a pearl button door knob on the right. I added yellow sequins to the door. On the back door piece, I sewing on a piece of hook tape. I sewed it on high enough to be above the pocket on the calendar. On the calendar, I sewed down some loop tape lined up to close the door. I sewed the two sides of the door together starting at the left side of the curved top. When I got around to the straight left side, I stitched both layers down to the calendar to make the hinged side of the door. 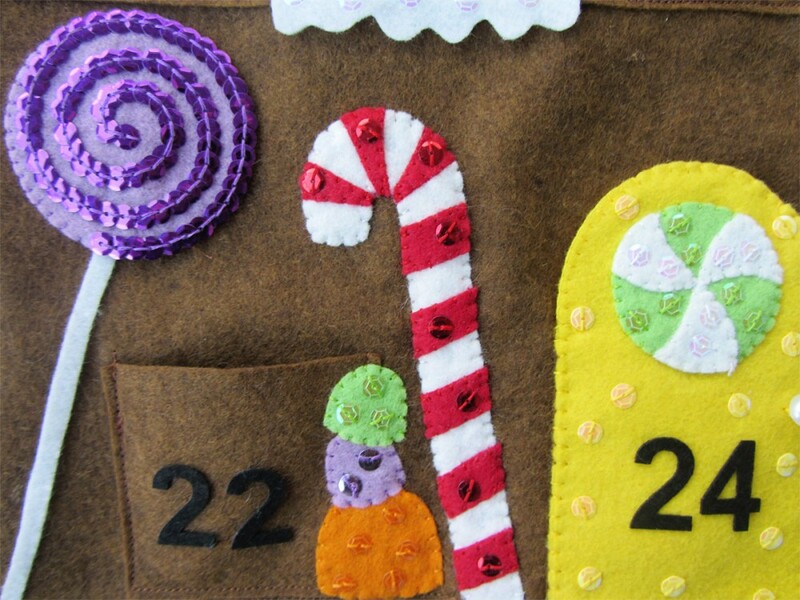 The candy canes are sewn the same way as the red and white candy sticks. I provided a pattern for all of the stripes around the cured part, then one stripe you can repeat down the straight part. 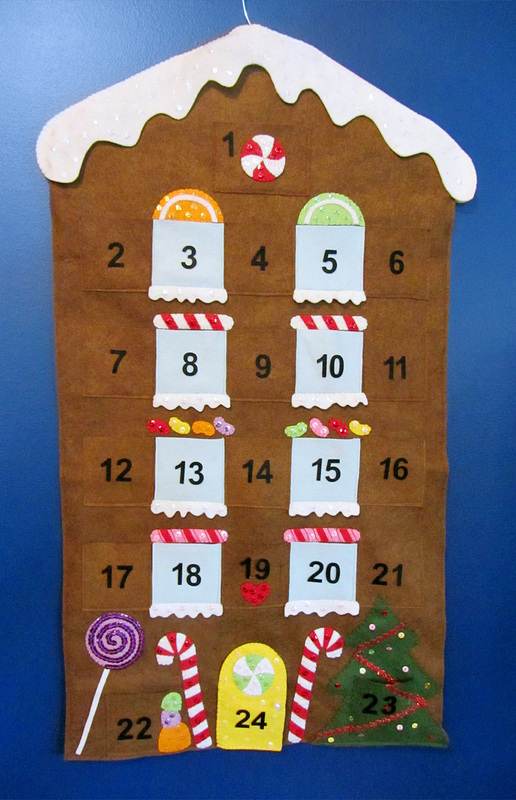 I sewed the candy canes down on either side of the door at a slight angle. 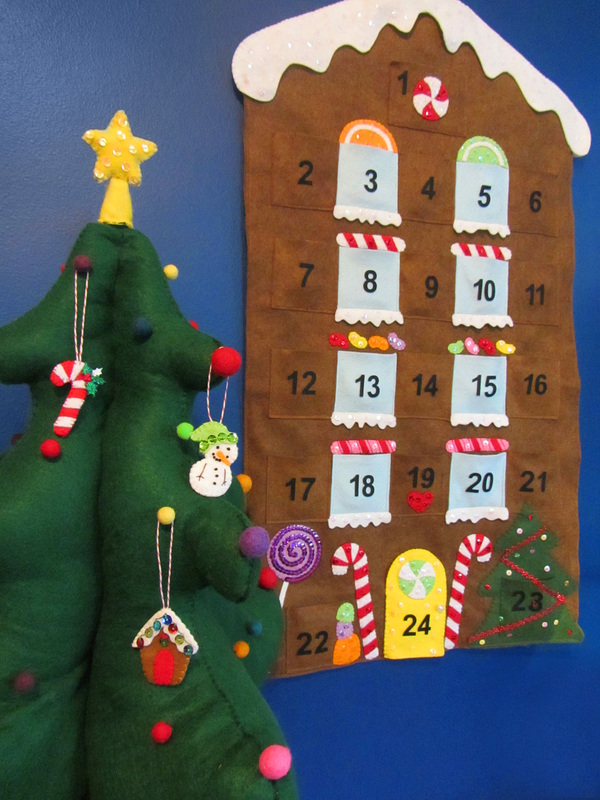 The tree sticks out a bit past the lower right edge of the calendar. You can either cut your calendar to have a matching bump-out like I did, or trim your tree to fit the corner. Using felt glue I attached my glitter ric rac down and folded the ends behind the tree. It held really well once dry. Once I decided the position of the tree’s pocket, I glued on more ric rac to the pocket square to match what was under it on the tree. I added assorted sequins to the tree and the pocket, stuck the number onto the pocket, then sewed on the pocket and tree by hand. The tip of the tree extends a bit onto pocket 21. The stack of gumdrops overlaps the right side of pocket 22. I tacked them down in a tospy turvy pile, sewed them down and added sequins. When sewing the back on, I used a sewing machine. I sewed the left, bottom and right sides completely, but only sewed halfway up each slope at the top. On either side of where the hanger hook goes, add some hook and loop squares. The snowy roof just slides on top. All done! I hope you enjoyed this free pattern. You can find the rest of my Christmas projects here. 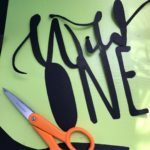 If you make one of my projects, please share a photo! You can find me on Facebook, Twitter, and Instagram. If you follow me on Facebook but are not getting my post, I apologize! FB is only showing my posts to 10-15% of those of you who have liked the page, and wants me to pay to show it to more. I can’t afford that, but feel terrible that many of you miss out on advanced copies of patterns, sneak peeks and polls for new projects. You can set your account to get notifications when I post (no more than once per day) by clicking the “like” button a second time and setting your notification preferences. Hopefully that will help. Thank you for all the well wishes for Jax as he recovered from pneumonia. We are finally back to normal here! If you’d like to support this site of send a little surprise to Jax, you can find his wishlist here. We are saving up to surprise him with a Wii U from GameStop. 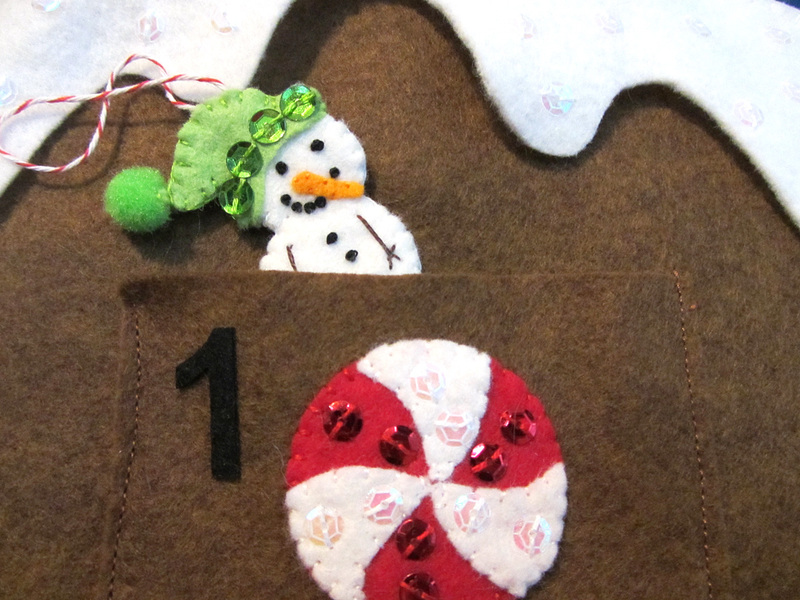 This entry was posted in Sewing, Sewing Projects and tagged Christmas, Free, Patterns, Sewing, Sewing Projects on November 20, 2014 by Stephanie.